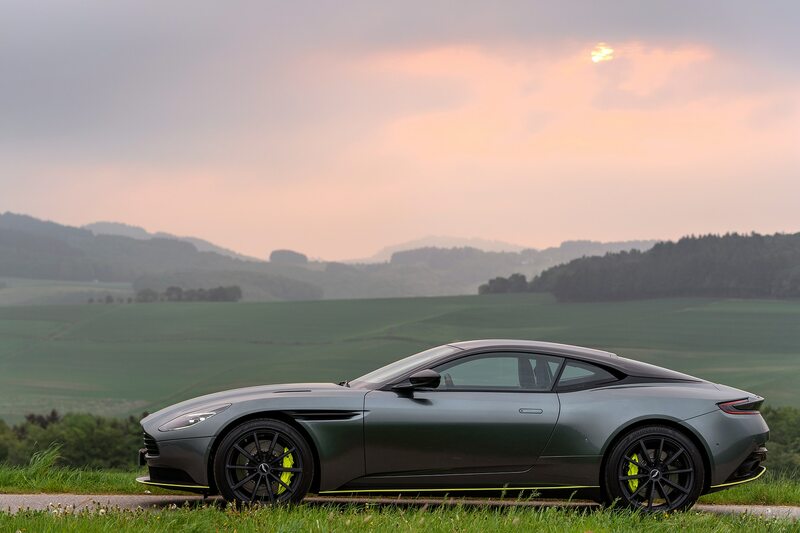 NÜRBURG, Germany — There is something serene about the German countryside around the Nürburbring. 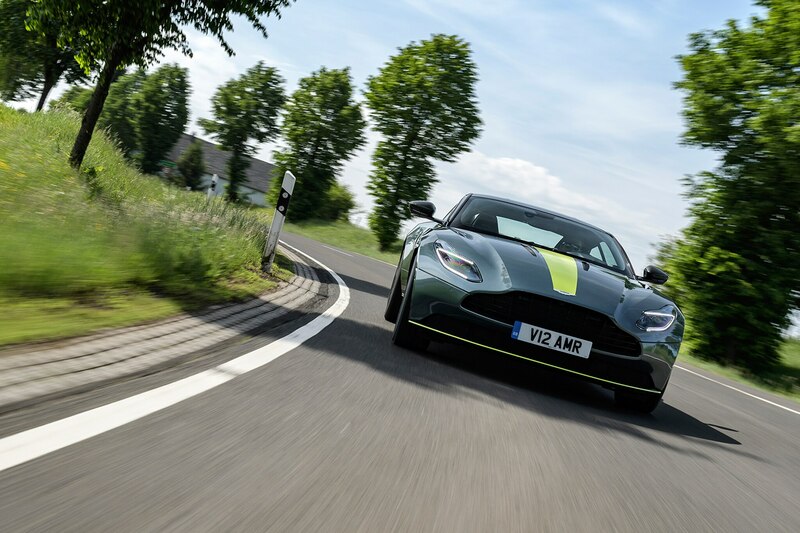 Small villages append the rolling, tree-lined b-roads where everything is quiet, everything is tranquil. 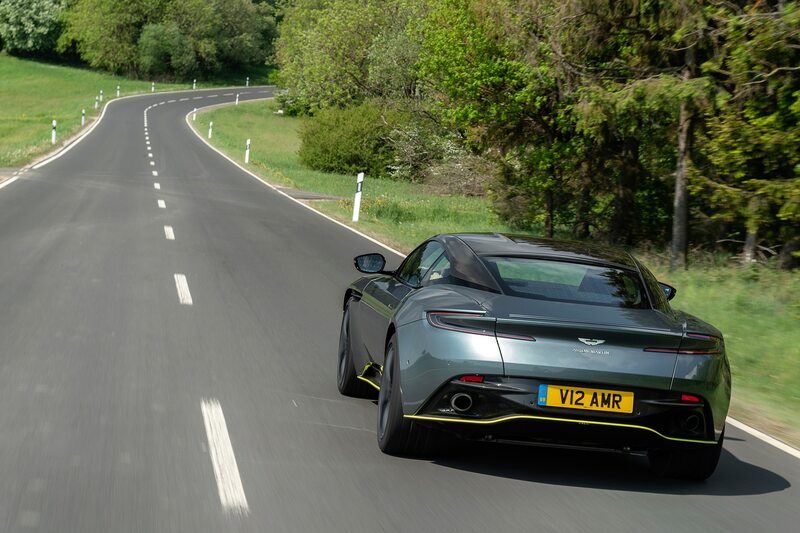 As I cruise through one of these postcard villages, I take a moment to recognize how smooth and quiet ‘my’ Aston Martin DB11 is; and it should be, it’s a GT car right? 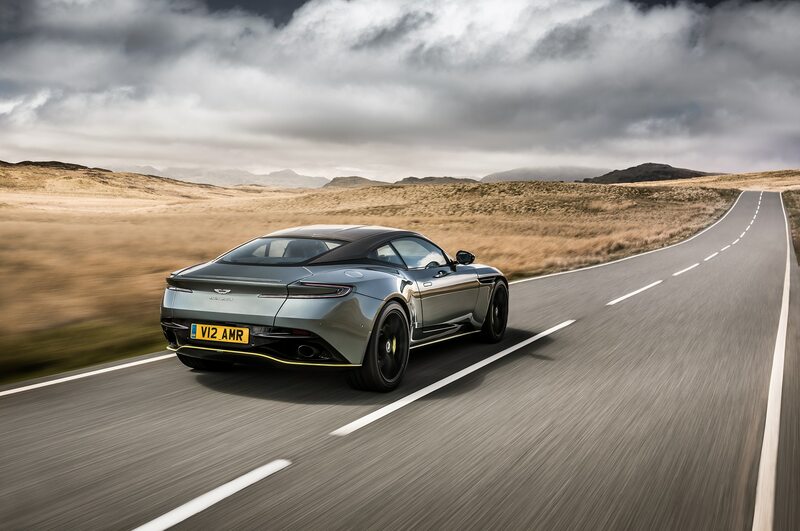 However, I am not in any old DB11. 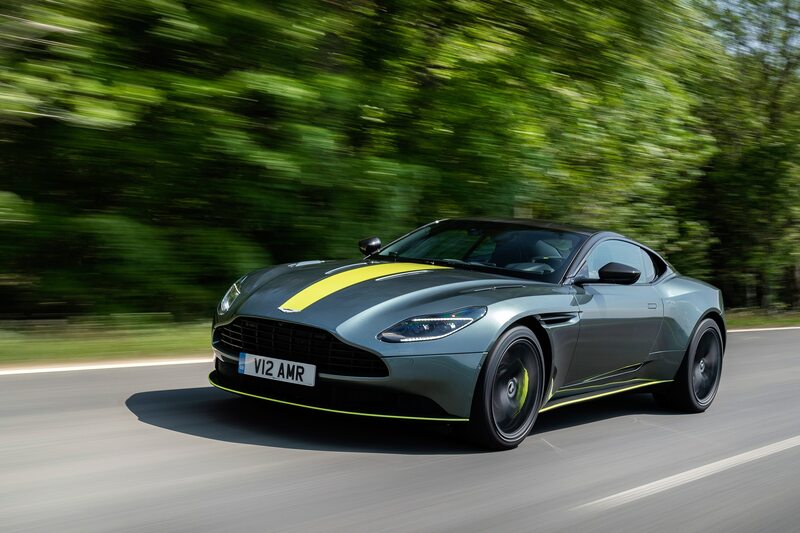 This is the 2019 Aston Martin DB11 AMR Signature Edition. 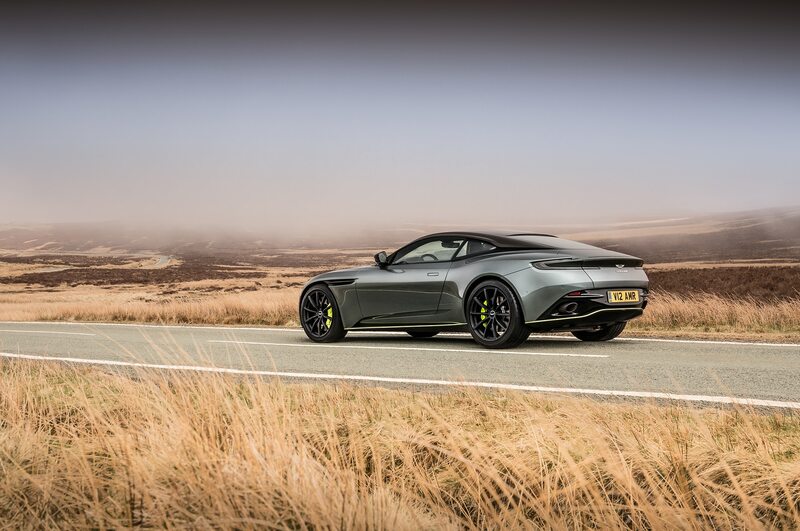 After sitting behind a tractor for what felt like an eternity, the road opens and I choose to make a pass. 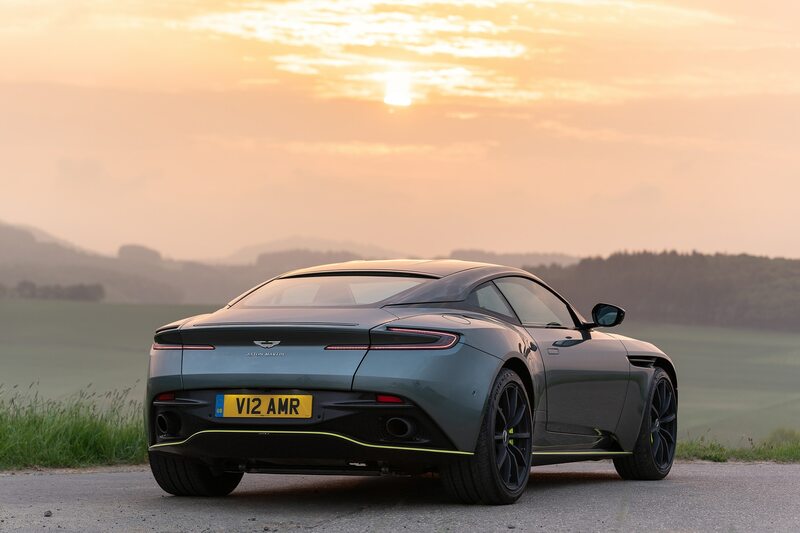 I click the wheel-mounted powertrain switch into ‘Sport’ mode, flatten the gas pedal, and the village shrinks in my mirrors as the twin-turbo V12 wakes from its slumber, sending 630 British horses to me down the road. 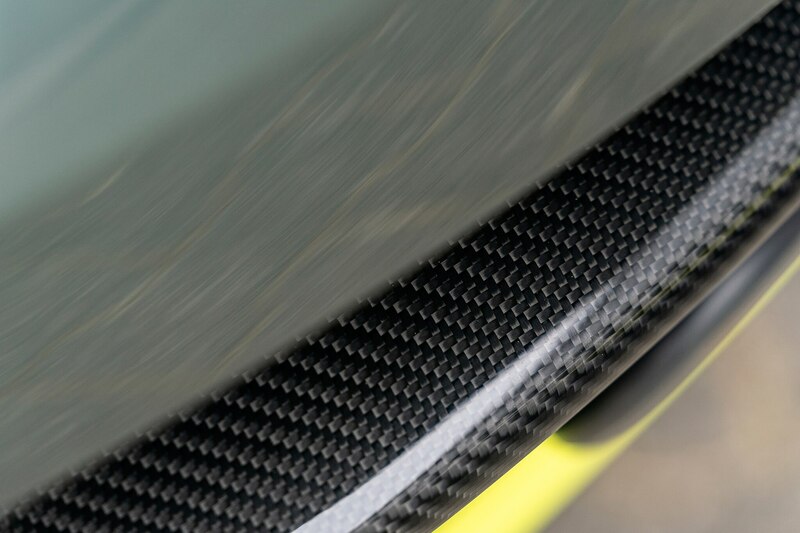 I lift off the gas and the new exhaust system pops, cracks, and gargles with a sound that invokes classic Group B rally car anti-lag vibes. 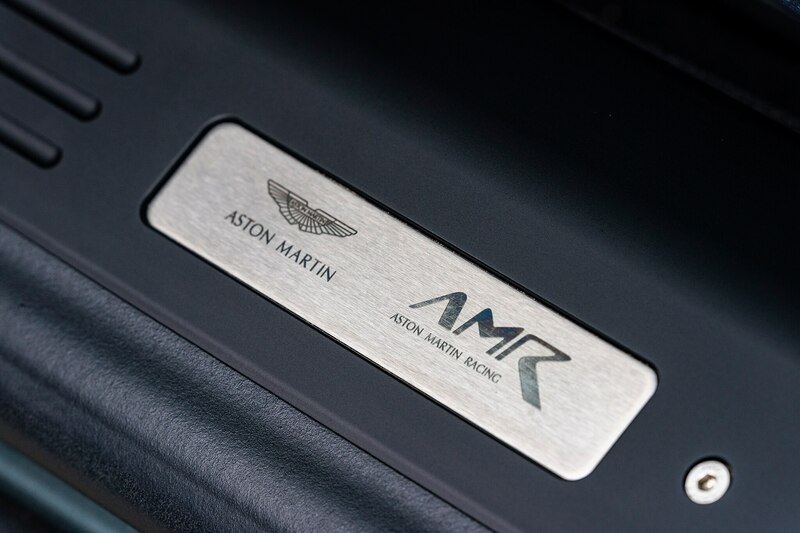 I giggle, then repeat. 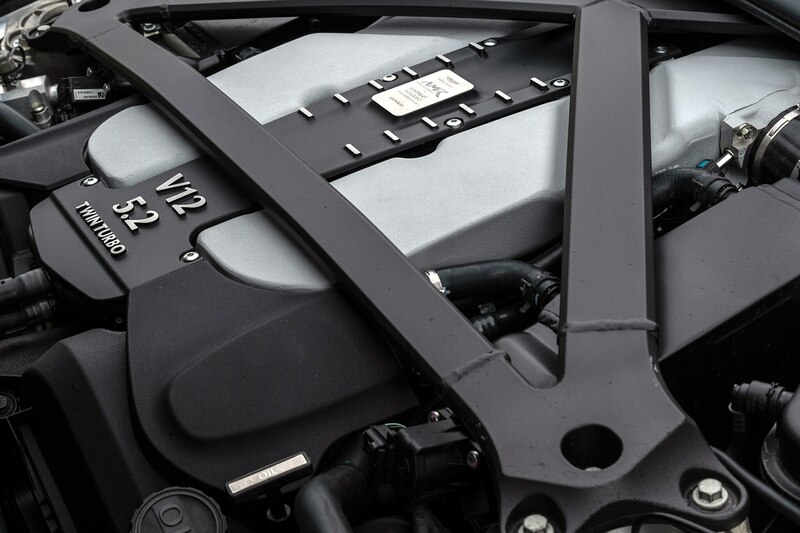 The once tranquil German landscape is now resonant in what is arguably one of the best sounding engines in the business. 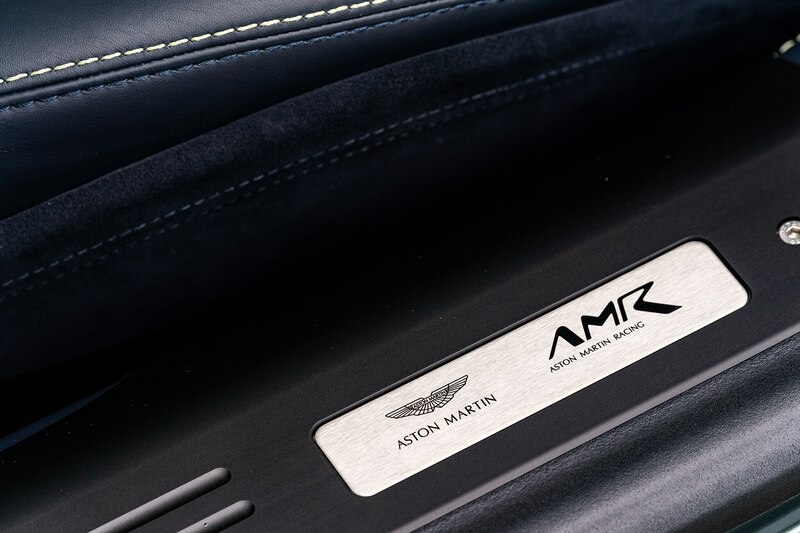 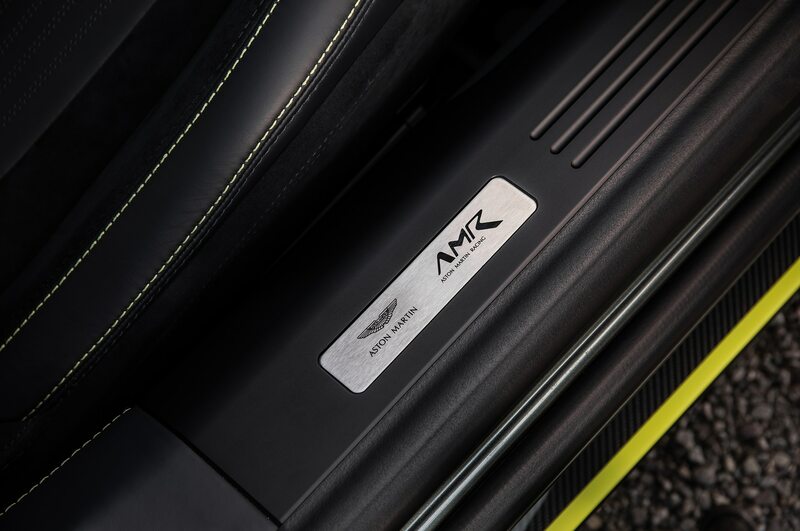 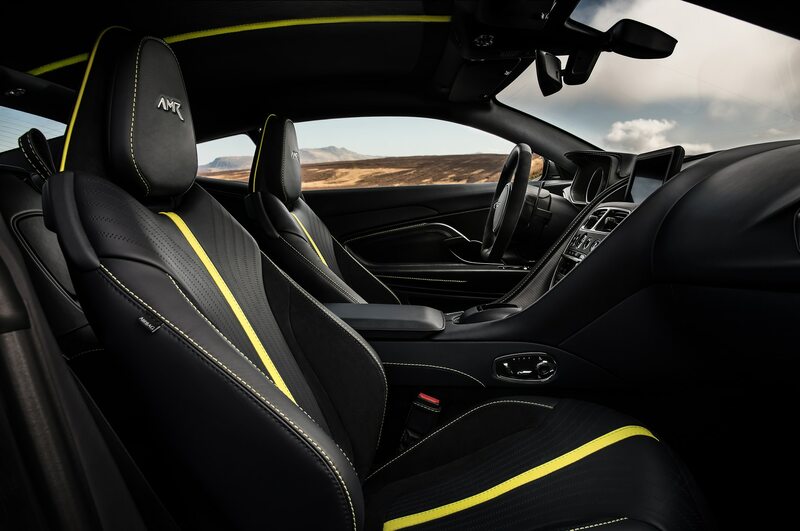 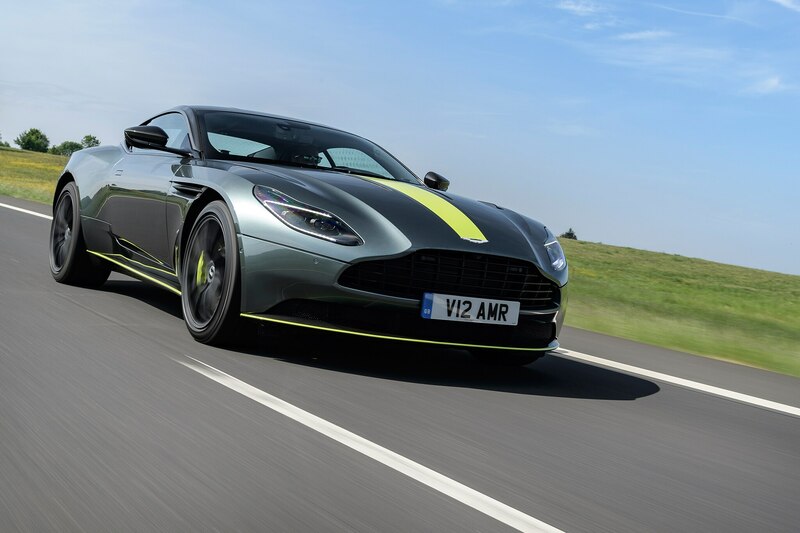 Aston’s AMR road car division was introduced to us at the 2017 Geneva Motor Show. 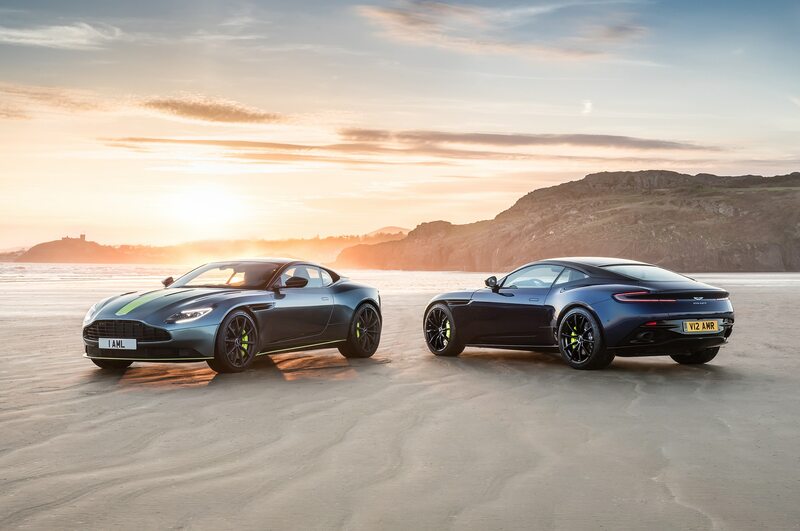 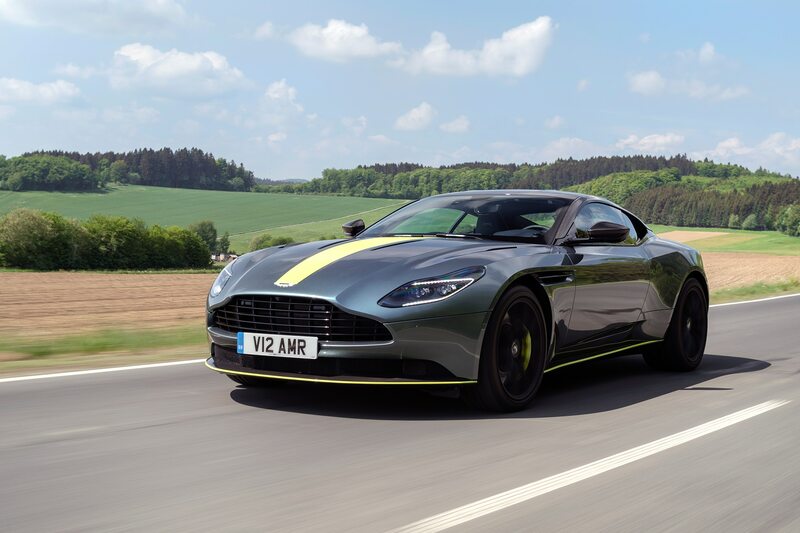 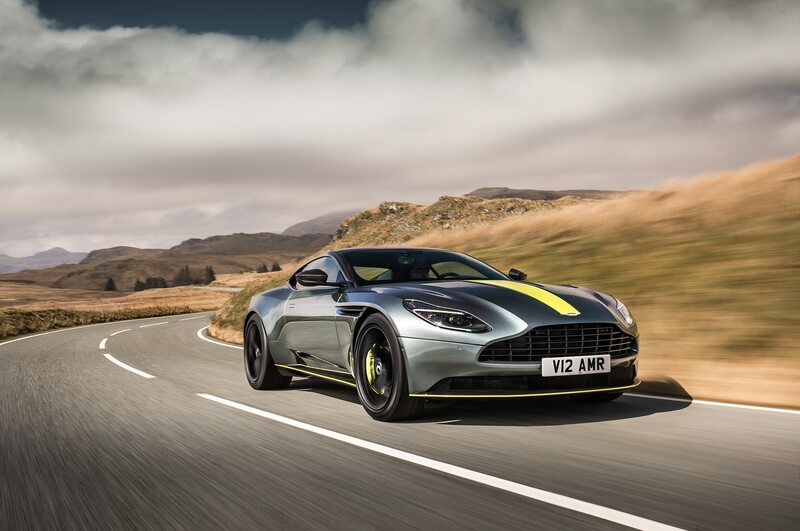 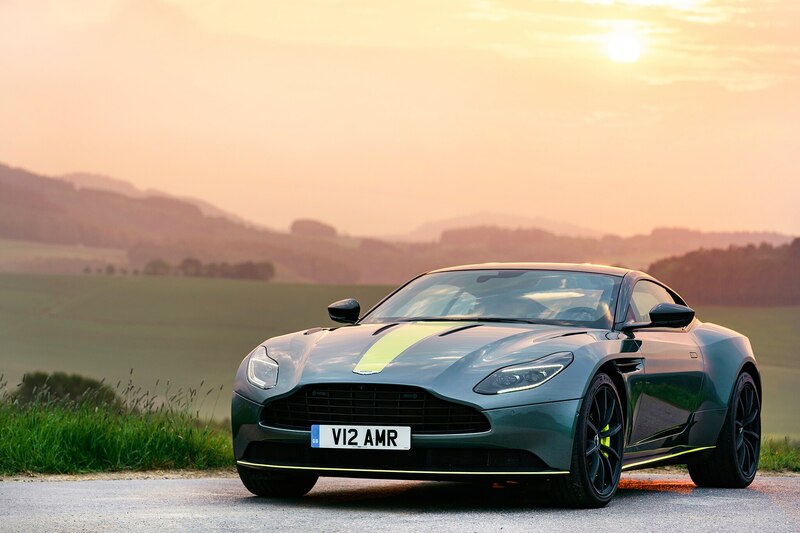 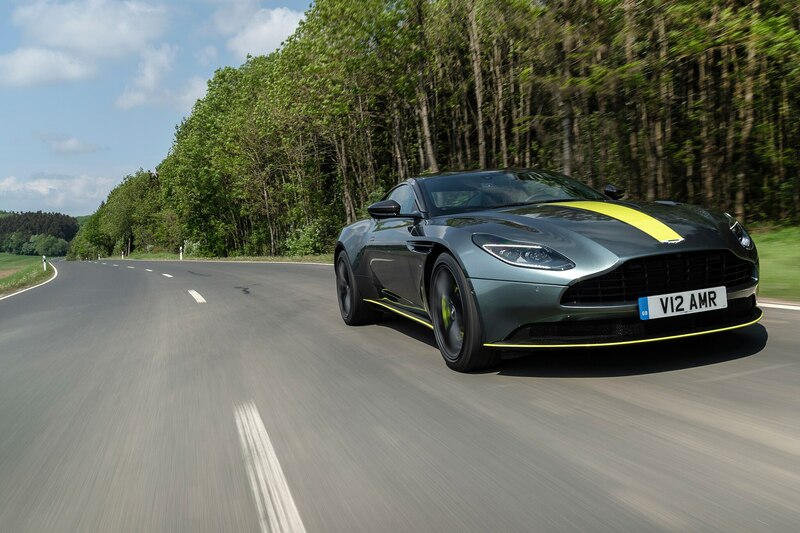 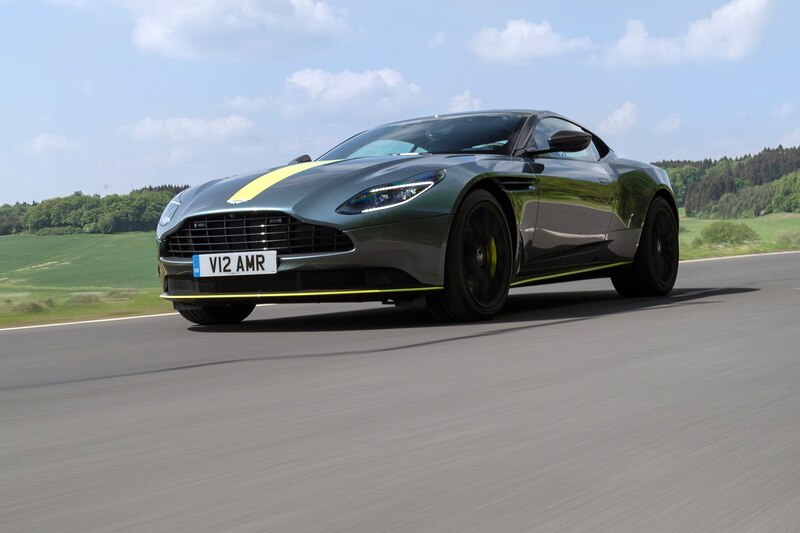 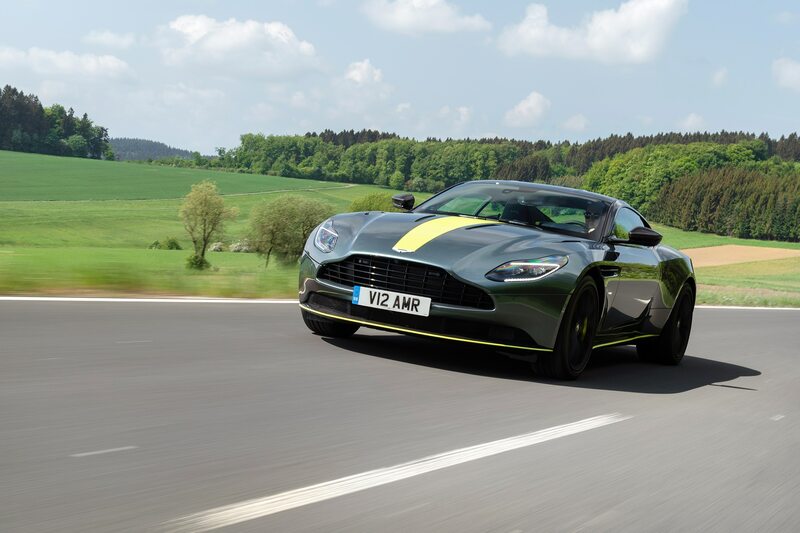 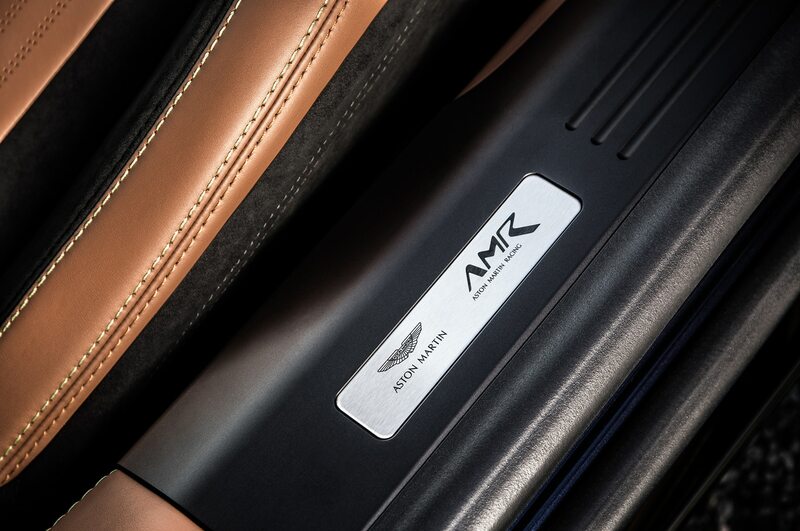 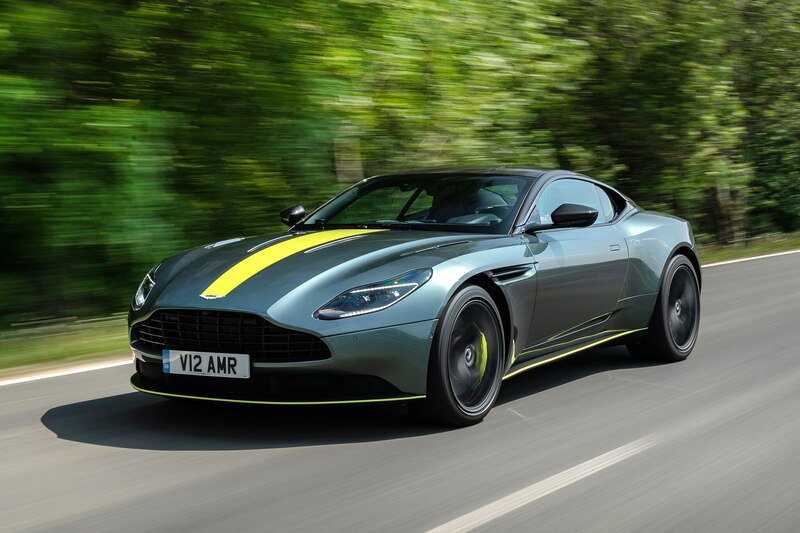 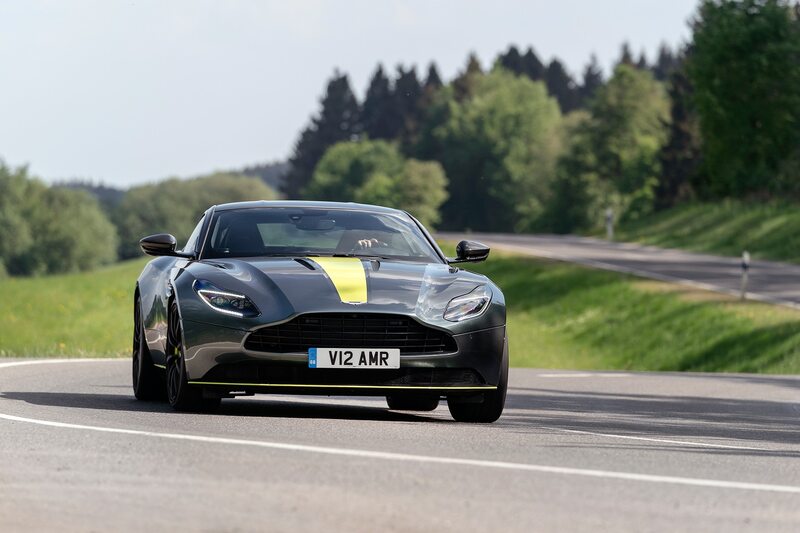 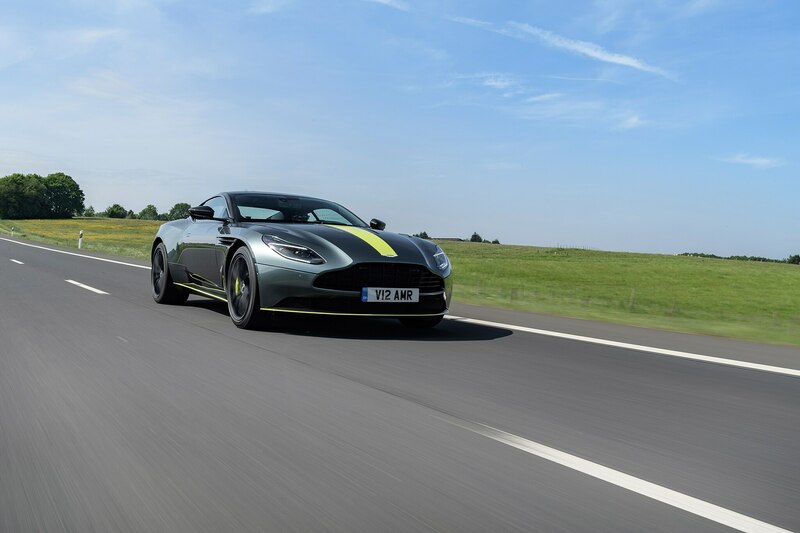 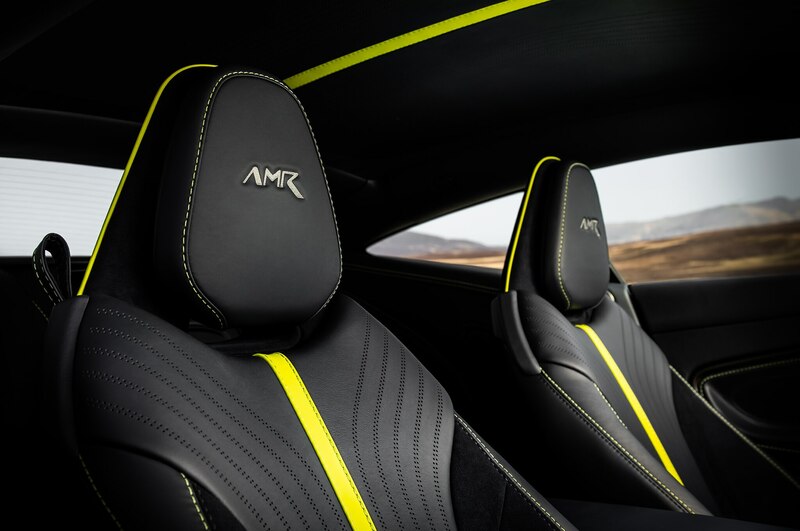 Tasked with creating more dynamic versions of existing cars, AMR started with the Vantage AMR and the mental Vantage AMR Pro, but the DB11 was next in line. 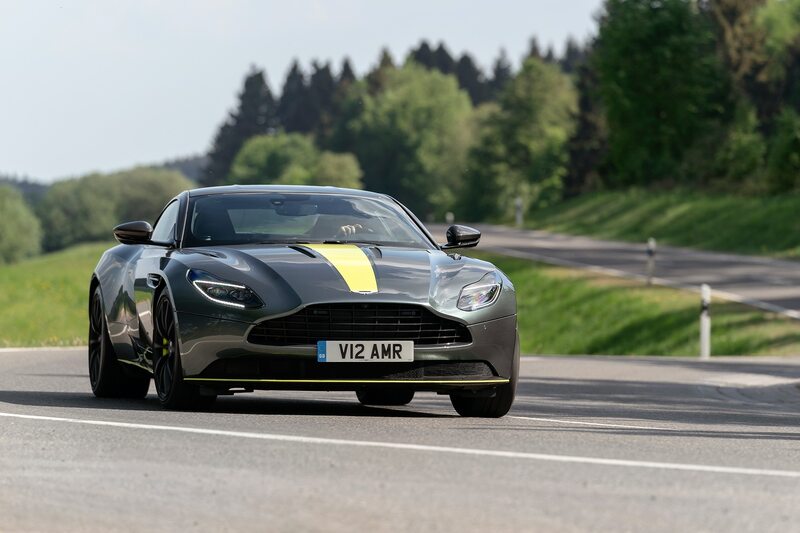 We liked the standard DB11 V12, so what’s this super GT like after a fettling from the AMR team? 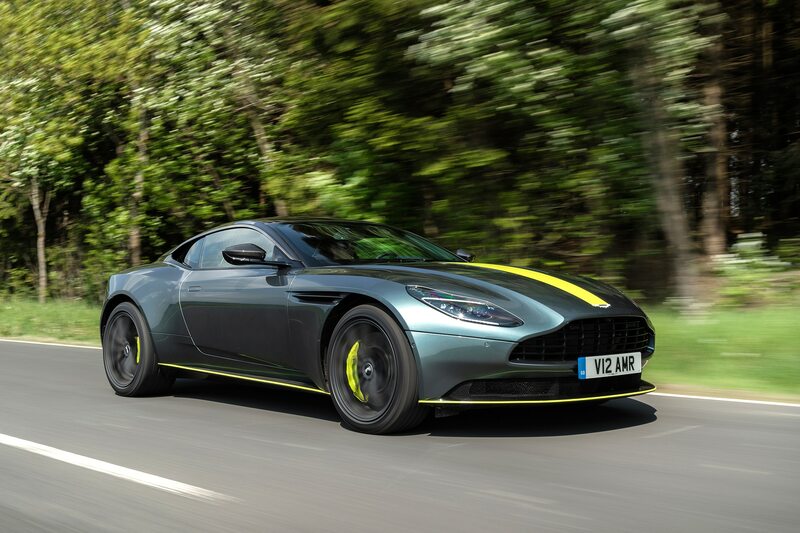 But before we get onto those lime green decals, let’s discuss the performance gains. 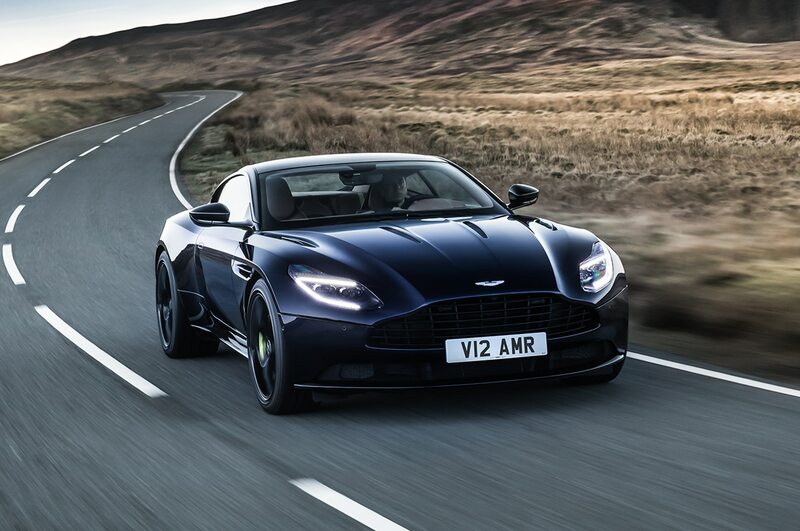 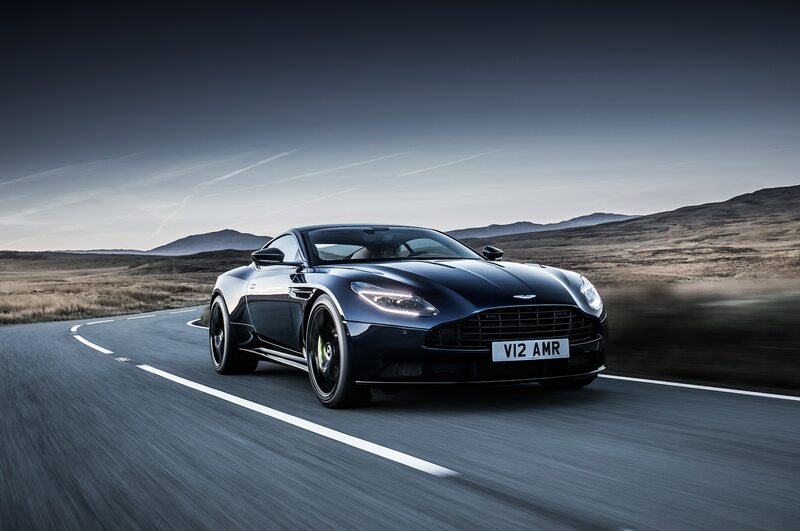 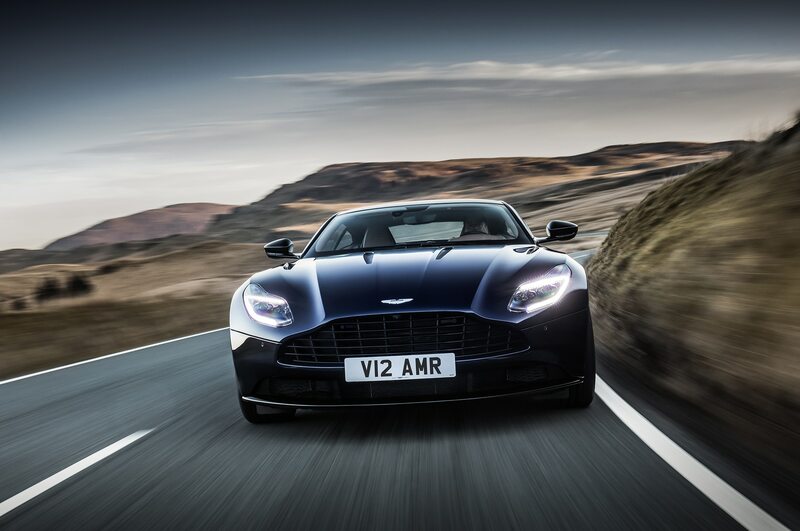 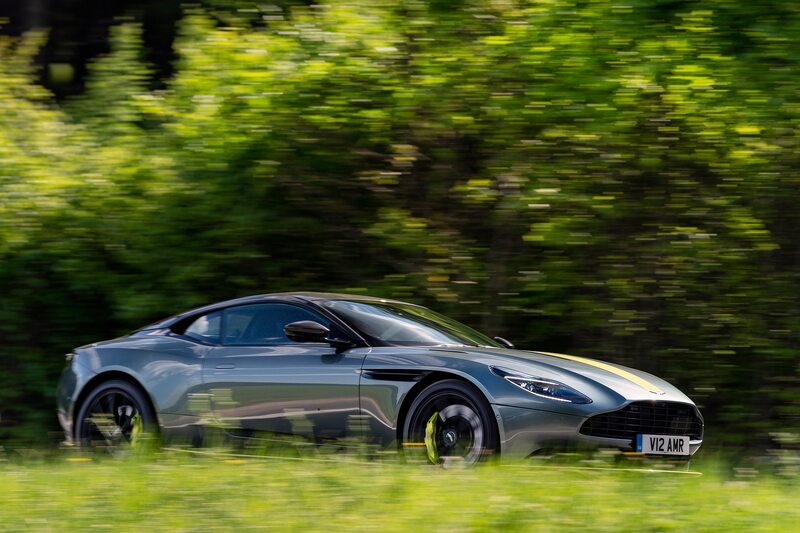 Outright power is up by 30 hp from the conventional V-12 powered DB11, rising to 630 hp thanks to an ECU re-calibration and marginal boost increase. 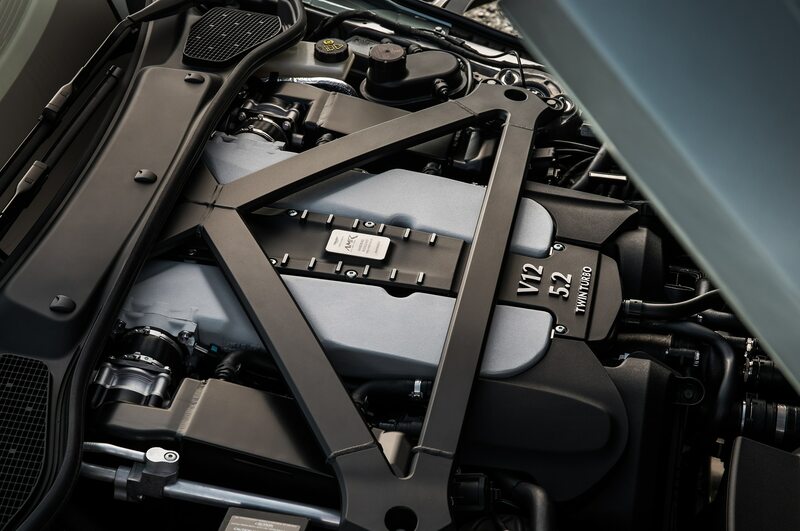 Not only is overall power up, but the torque curve has been improved, extending the previous 516 lb-ft of peak torque all the way up to redline. 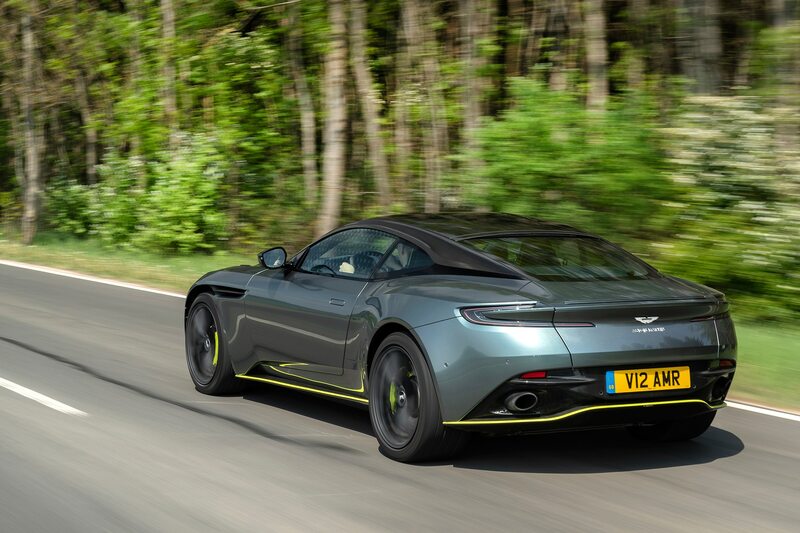 The combination of these upgrades makes for a 0-60 time that’s 0.2-second quicker than before, coming in at 3.5 seconds, and a top speed of 208 mph. 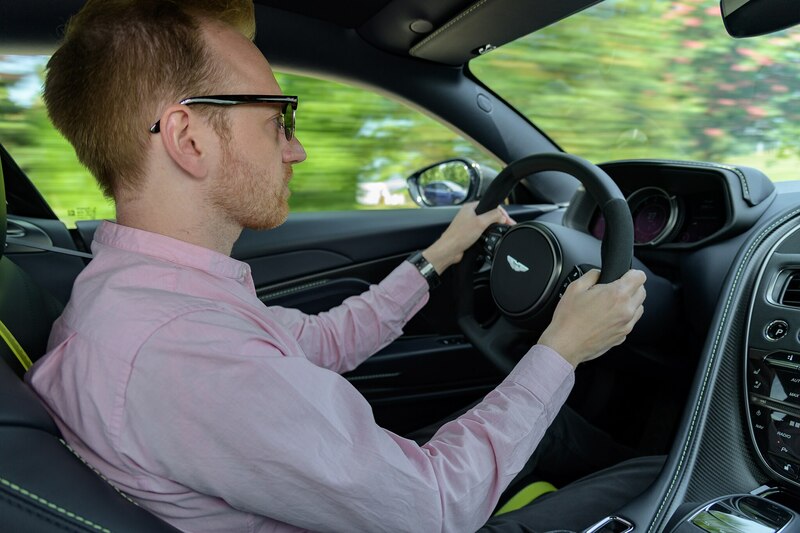 The power becomes immediately noticeable when I am let loose on one of Germany’s great gifts to the world: the unrestricted Autobahn. 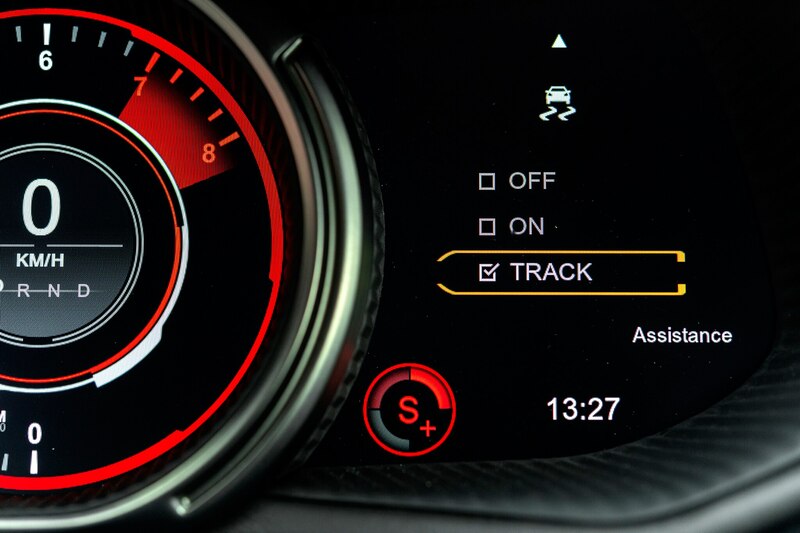 I place myself in the outside lane and set the powertrain into the most aggressive ‘Sport+’ setting. 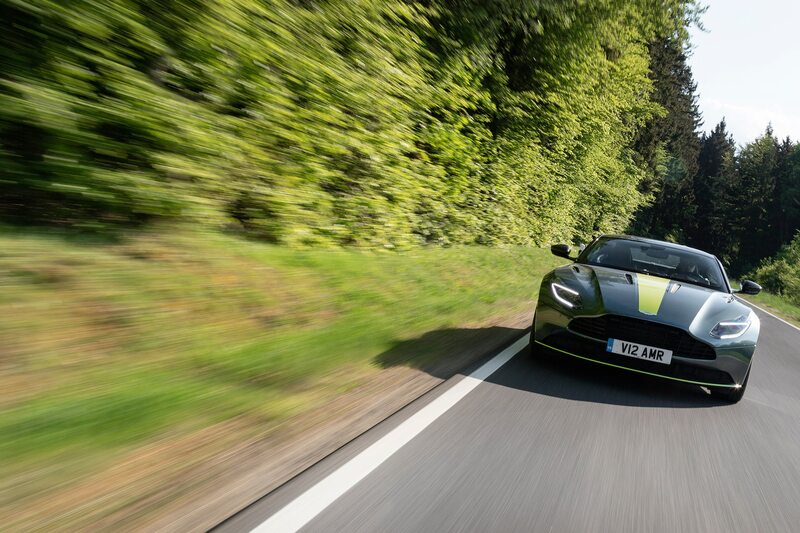 The imposing profile of an Aston Martin with bright green stripes is enough for the traffic in front to move over. 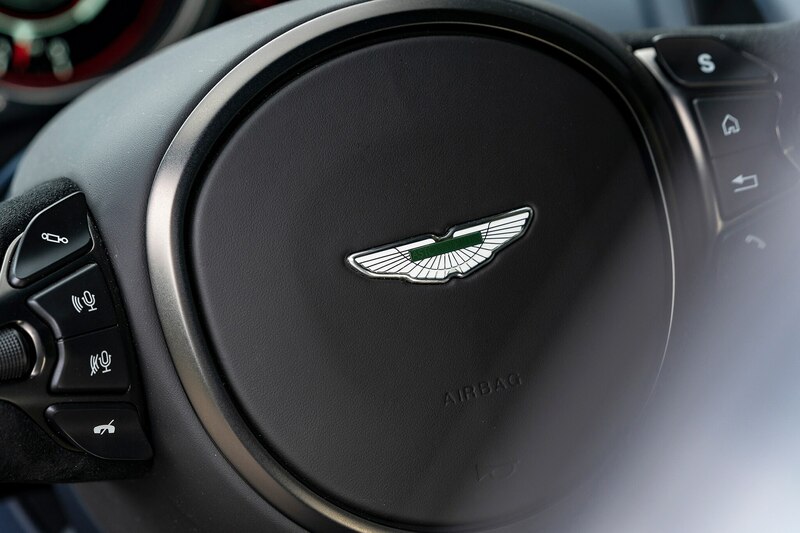 They know what’s coming. 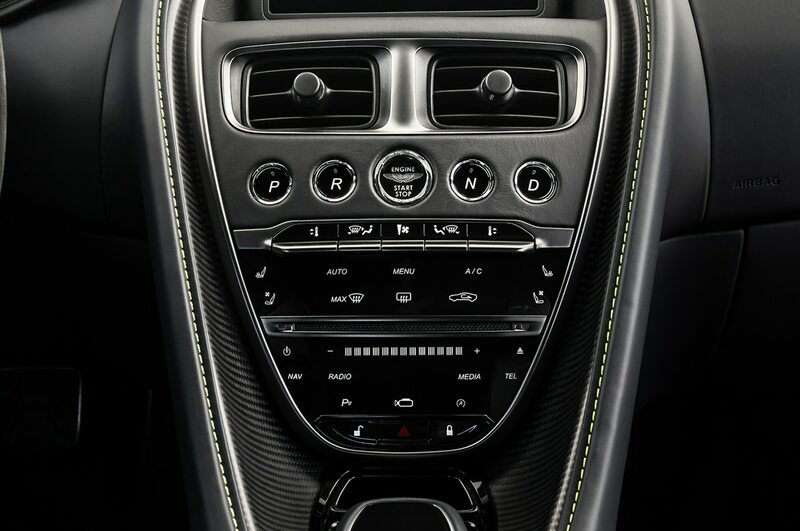 As I firmly place my right foot all the way down to the floor, I’m swept away by a wave of torque. 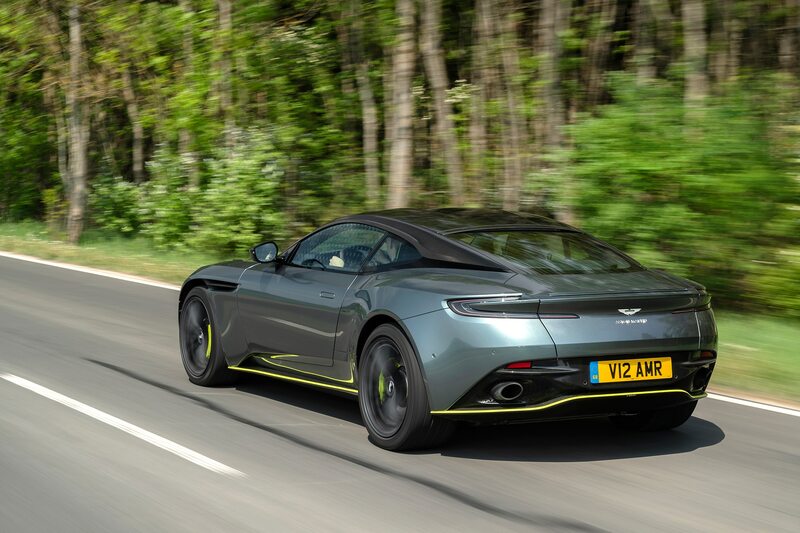 The engine hardly feels turbocharged and it’s mere seconds until I’m closing in on 170 mph. 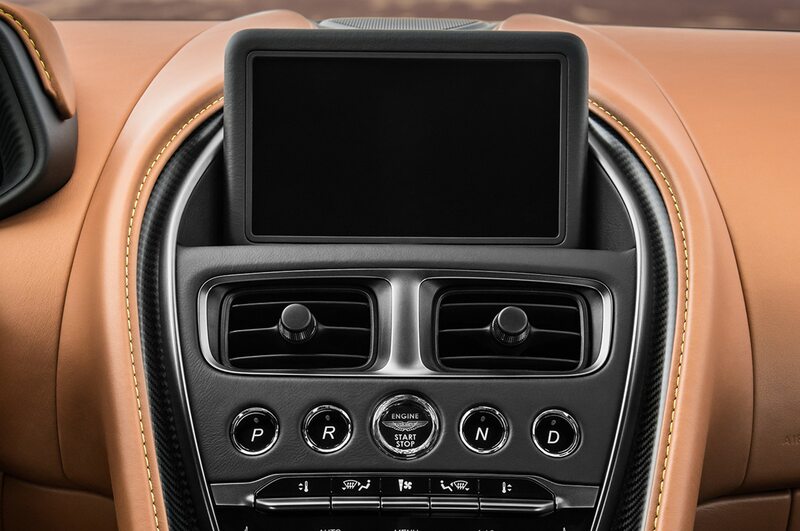 The Mercedes-sourced infotainment center then kindly reminds me that I need to exit soon, cutting my fun short. 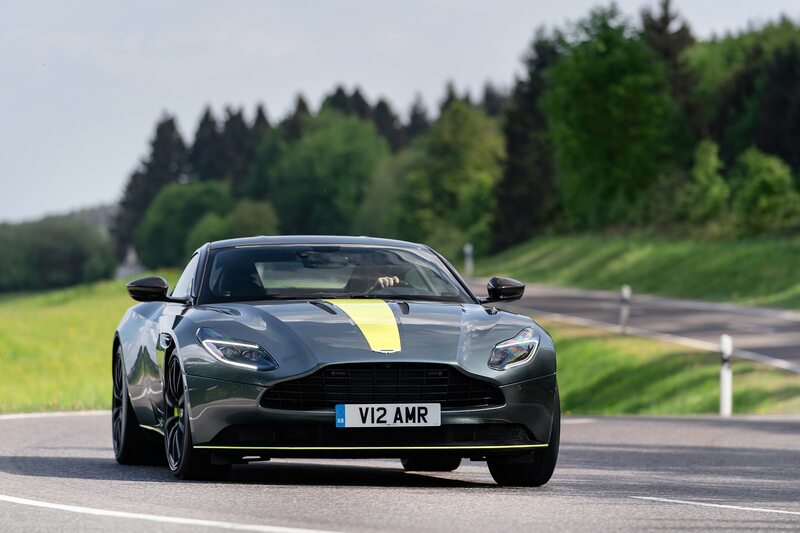 Never mind though, the next stretch of the pre-determined route will take me on the meandering back roads surrounding Nürburg. 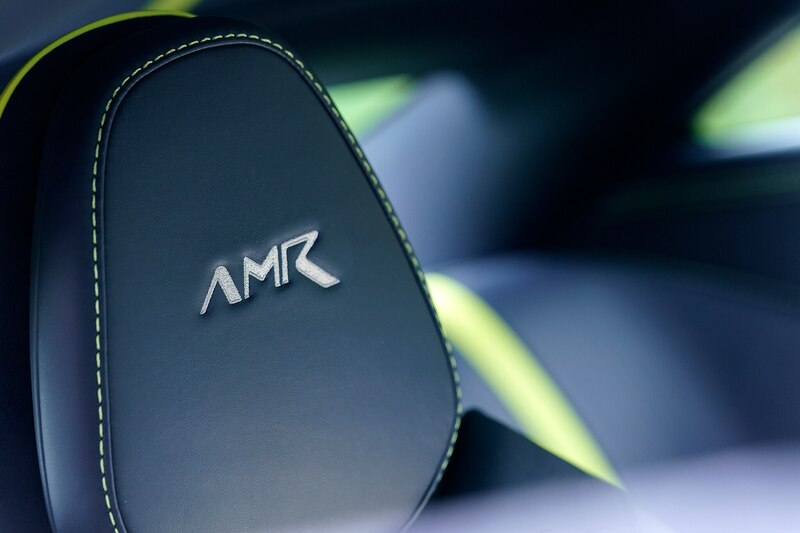 A perfect opportunity to test the AMR’s abilities in the twisties. 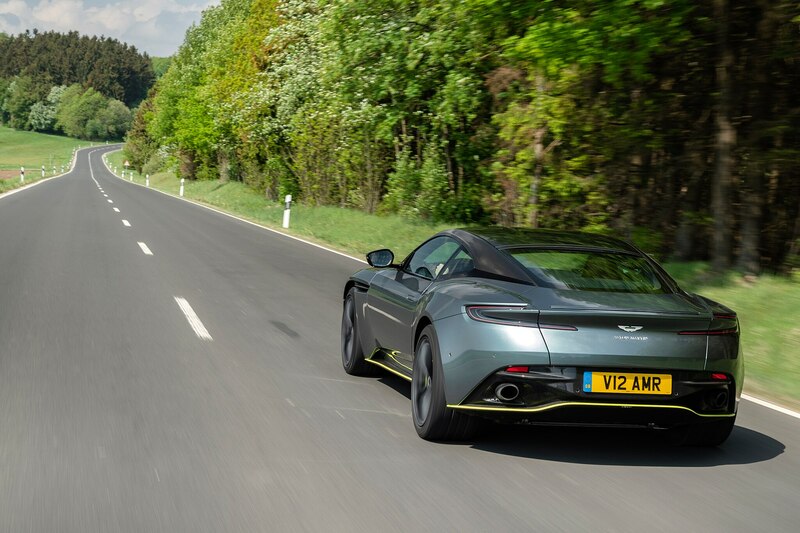 Dampers are stiffer in comparison to the existing DB11 V12 thanks to re-valving, but spring rates remain the same. 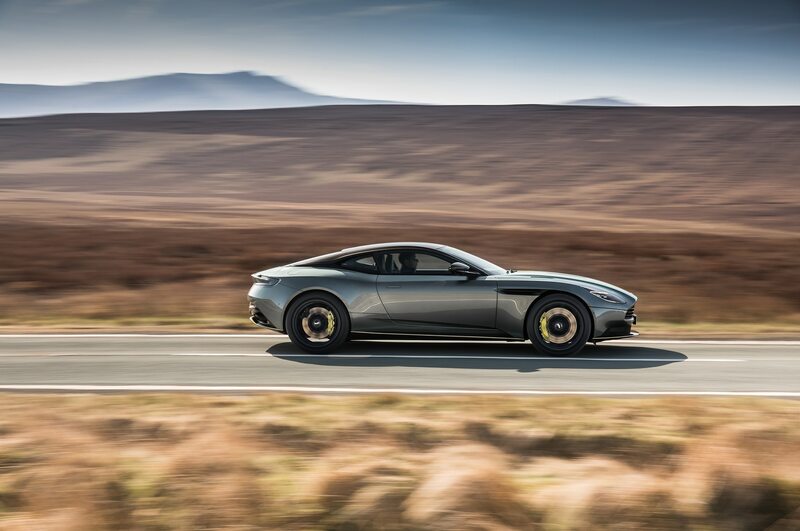 Maintaining the spring rate means that the floating, smooth ride of the DB11 is retained in a longitudinal way. 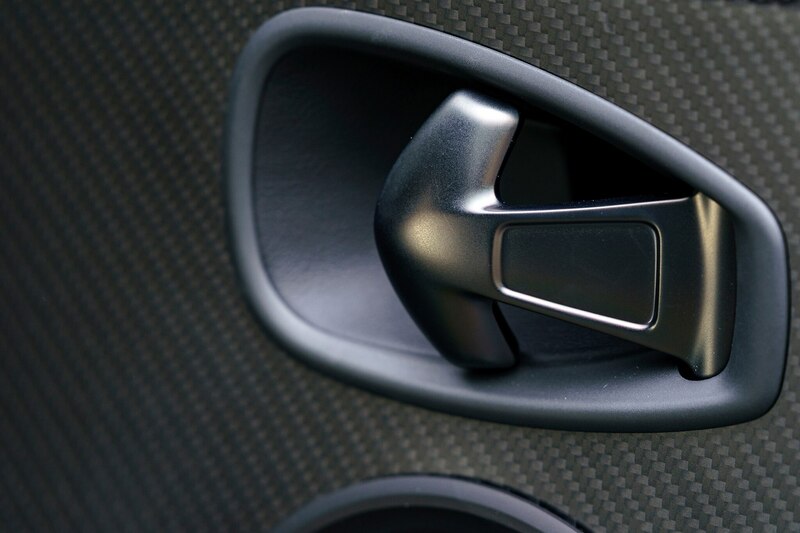 However, lateral acceleration characteristics have improved thanks to stiffer dampers in lower velocity maneuvers. 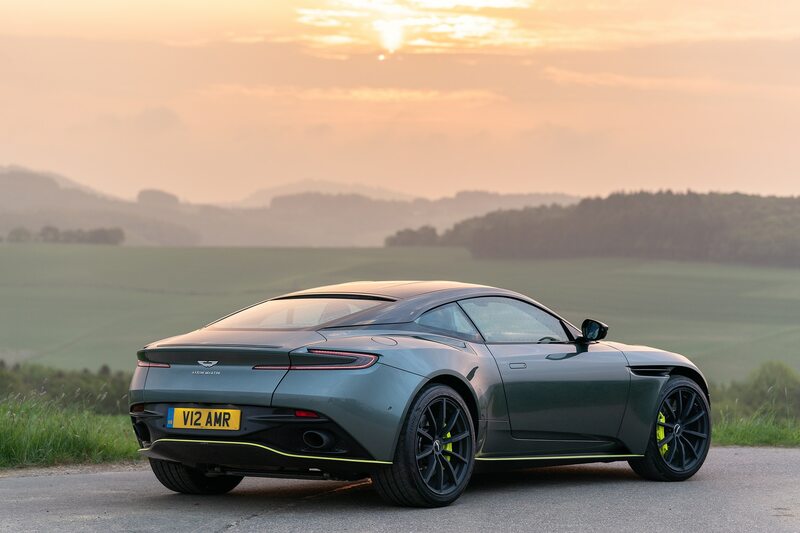 The bushings holding the subframe to the chassis are made of a stiffer rubber compound than those of the stock DB11 V12, but they’re also the same as the ones found in the DB11 V8. The combination of subframe and damper stiffening gives the Bridgestone Potenza Potenza S007 tire a ten-percent increase in contact patch size in dynamic situations. 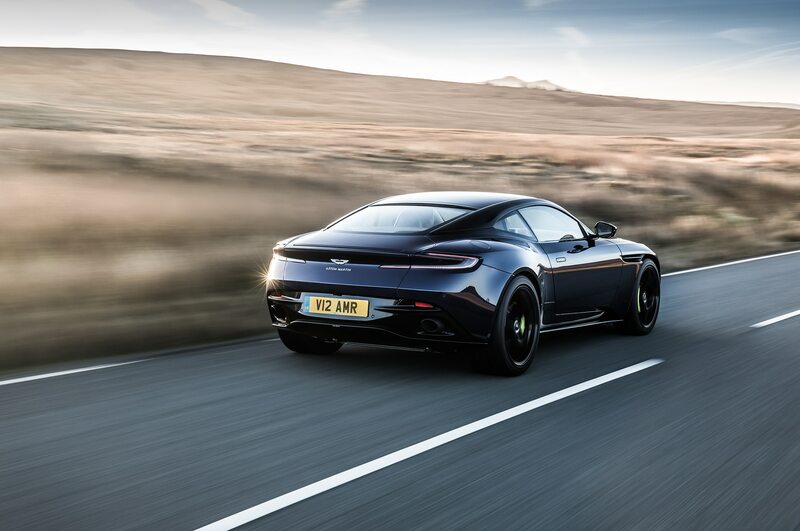 The wheels are now forged alloy units, saving 7.7-lbs per corner of unsprung weight over the existing DB11 V12, further improving sporting prowess. 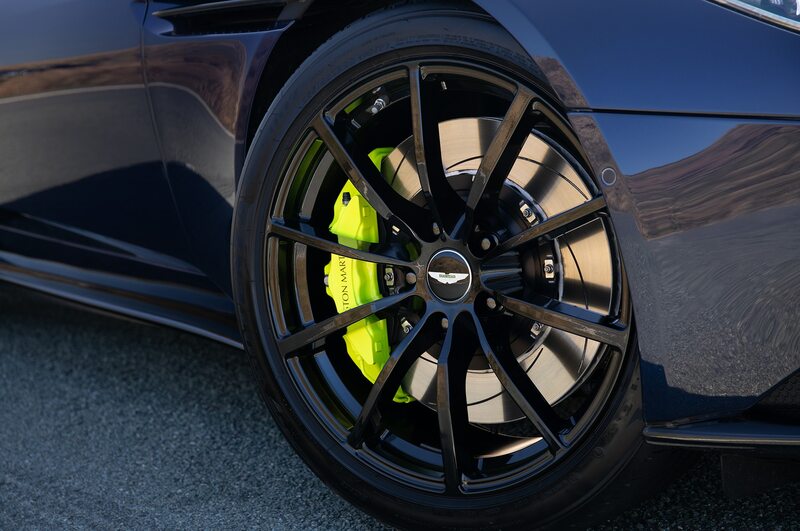 Breakaway characteristics of the rear axle predictable and easy to control. 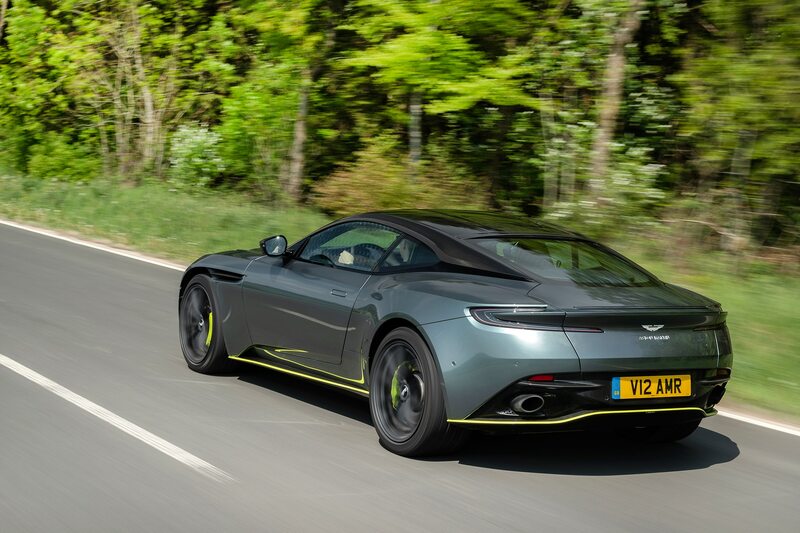 Provoking those big hips into oversteer is remarkably easy thanks to the front-engine/rear-drive layout and the mass of torque available to you from low RPM. 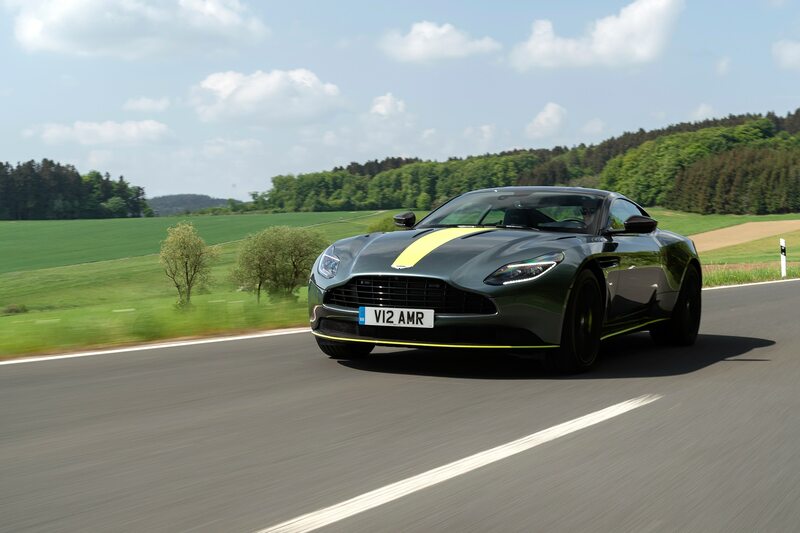 Having the powertrain in Sport+ mode gives you full performance and aggression, though I found that keeping the chassis in GT mode was the best for backroad blasts. 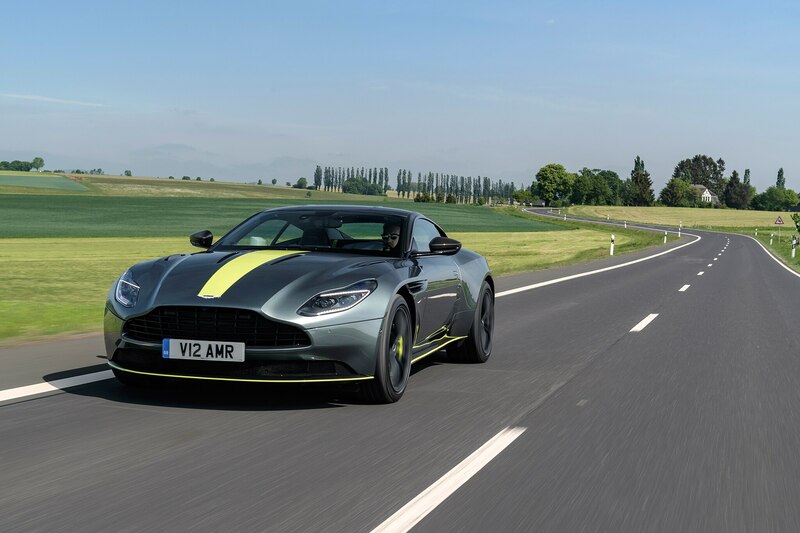 The softer damped GT mode allows the rear tires to bite into the road surface, giving you good mechanical grip on bumpy, uneven roads. 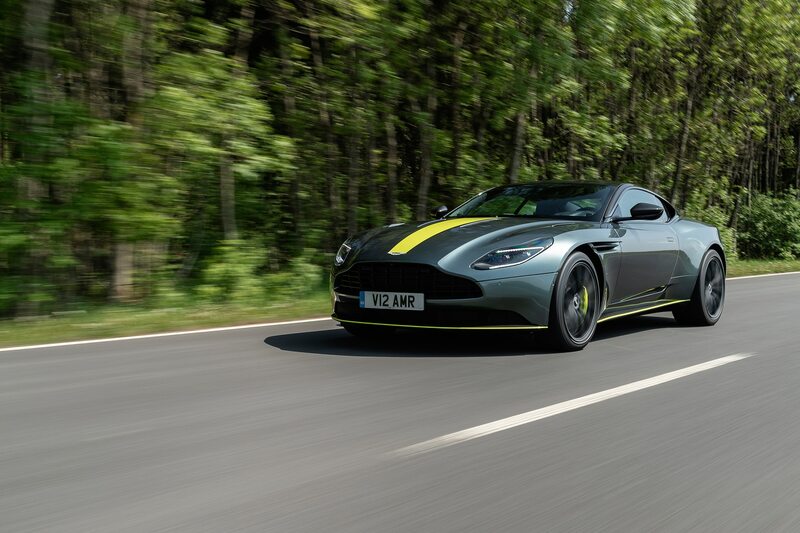 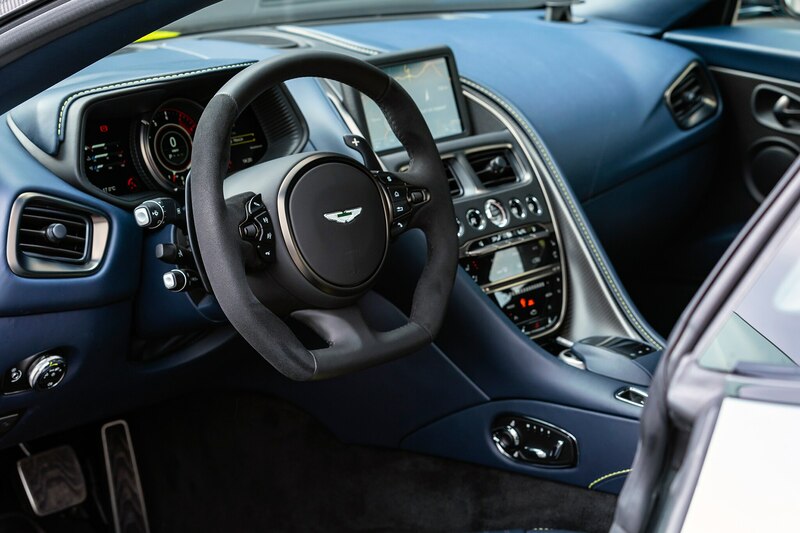 Steering is more direct than the existing DB11, thanks to a 0.5-mm thicker anti-roll bar connecting the two front corners, something that Matt Becker—Chief Engineer, Vehicle Engineering—and his team were stubborn about having. 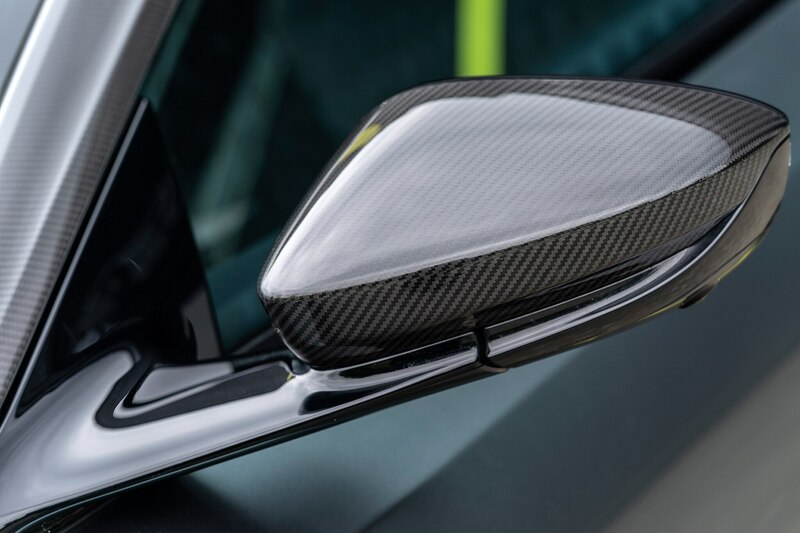 The business case was to not have any new parts that require any new manufacturing, logistics and cost implications, but Becker was adamant that the car needed a thicker front ARB to balance out the changes to the rear axle, and we can thank him for his stubbornness. 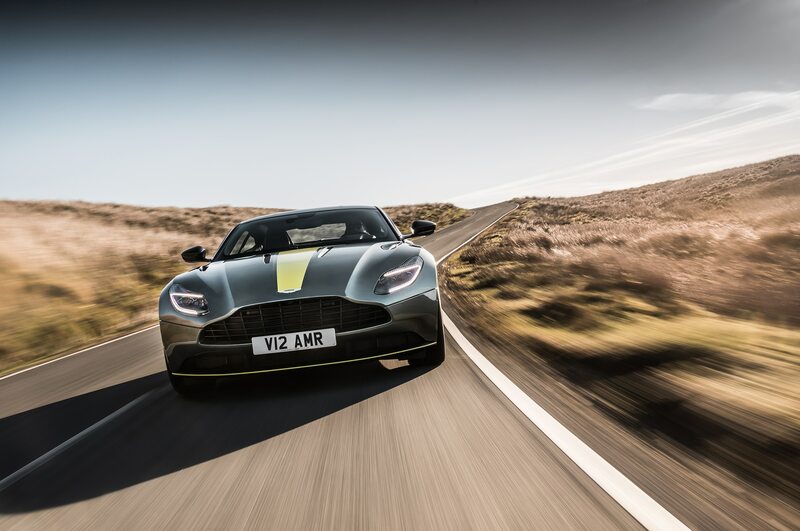 The front end certainly feels as if it bites in quicker than before, and married to the chassis changes at the rear, makes for a sportier feel to the entire chassis. 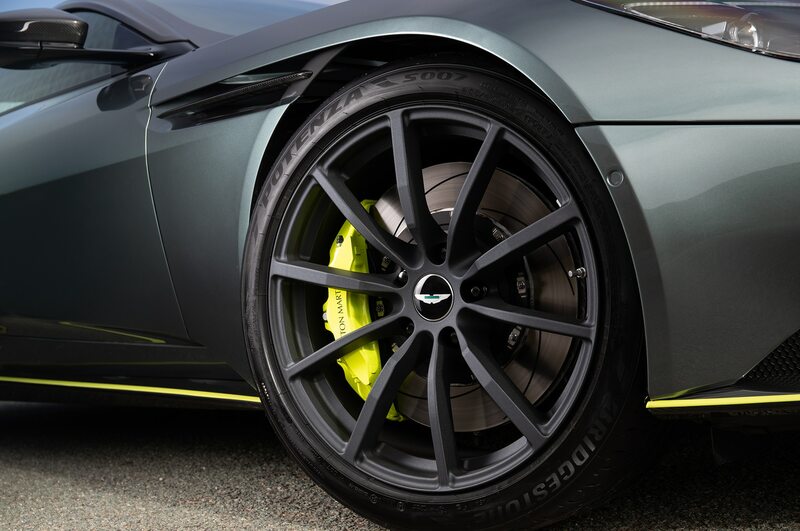 Carbon-ceramic brakes are not available on the DB11 AMR, and it makes sense. 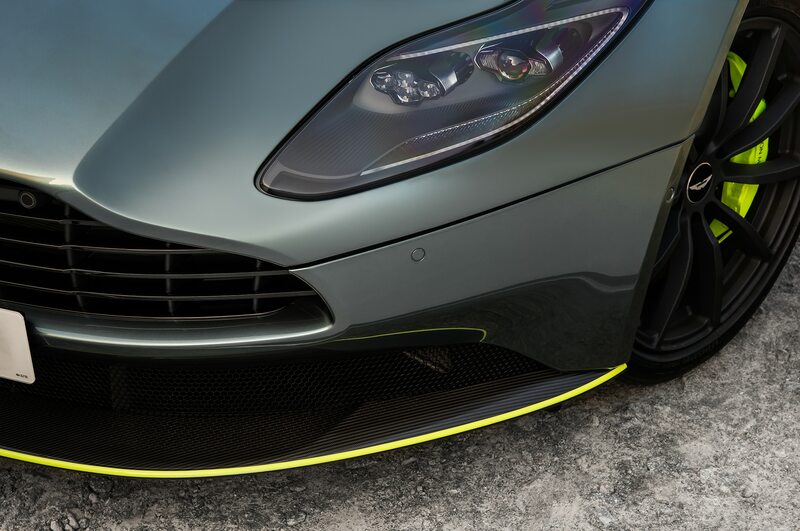 The extra expenditure to get what is pretty much race car braking technology on a GT car would defy logic. 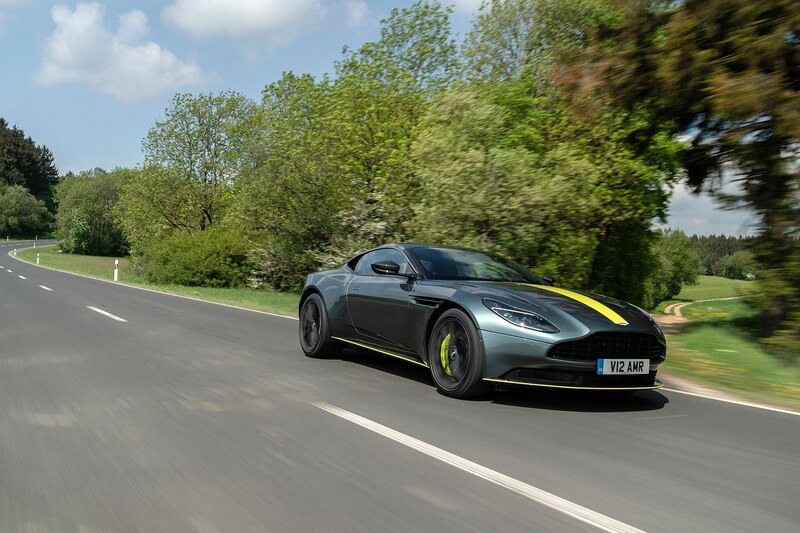 The soft bite of the conventional steel rotors suit the demeanor of the DB11 AMR far more than grabby ceramics would. 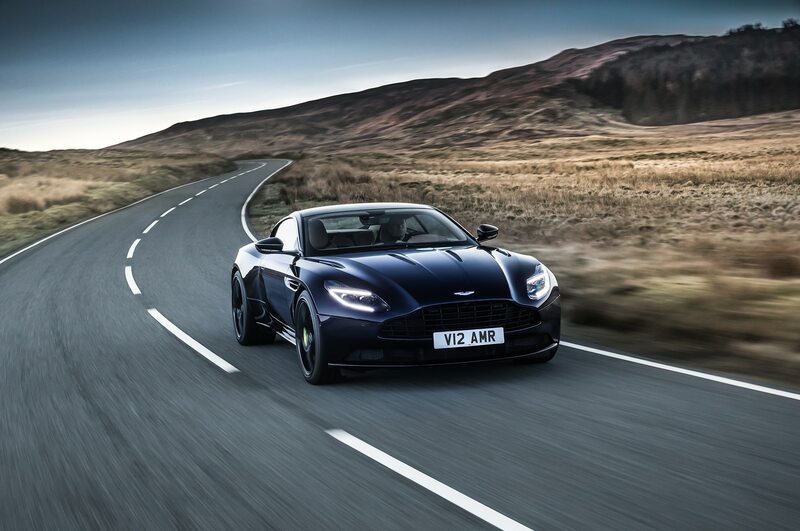 Good decision Aston. 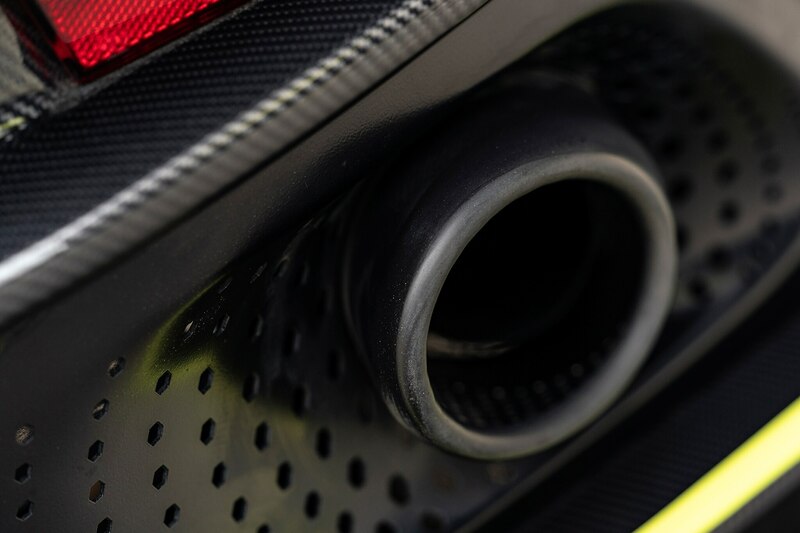 The exhaust system also benefits from a tweak, with the attitude valve for the system is open for more of the time. 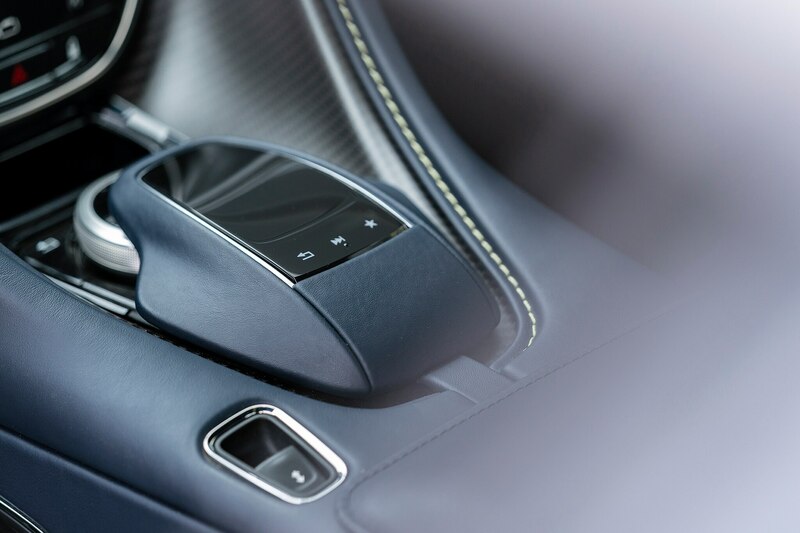 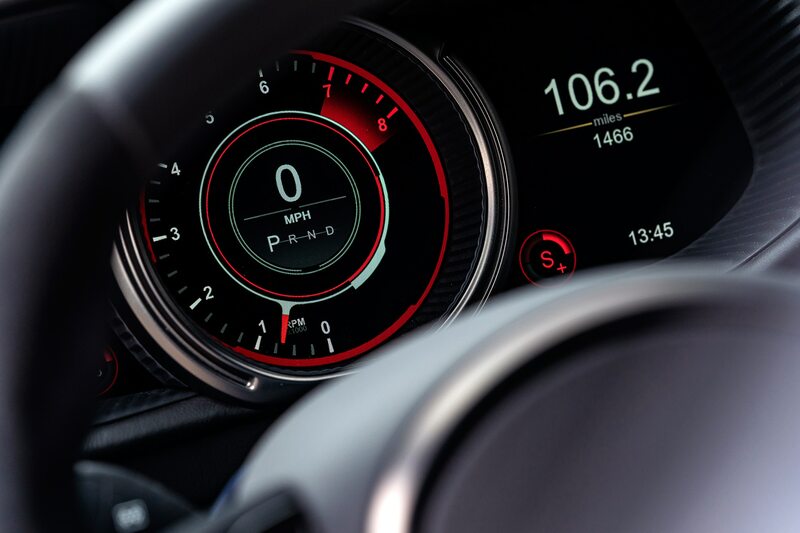 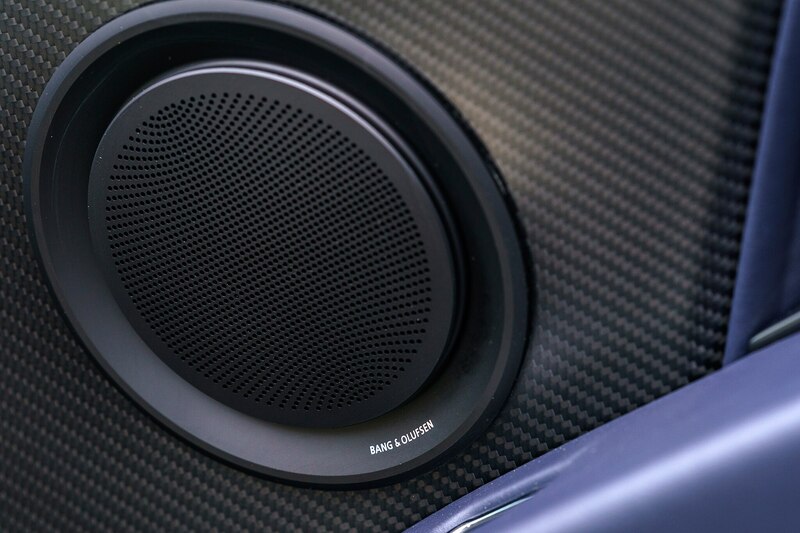 Although outright decibel level is unchanged, it gives a more aggressive vocal track for the car in Sport and Sport+ modes. 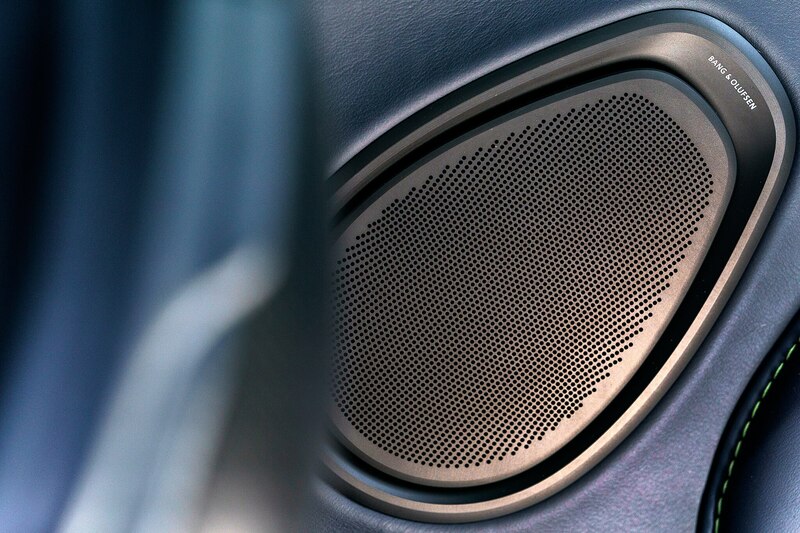 It also gives the car the lift-off pops and crackles that speak to your inner child. 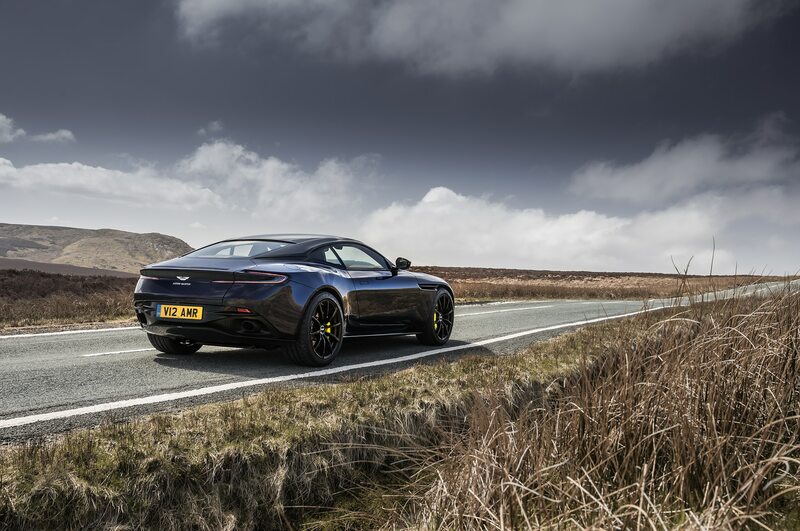 Previously unavailable on the DB11 V12, extra fuel is fed to the engine and ignition timing is retarded to induce highly satisfying overrun theatrics. 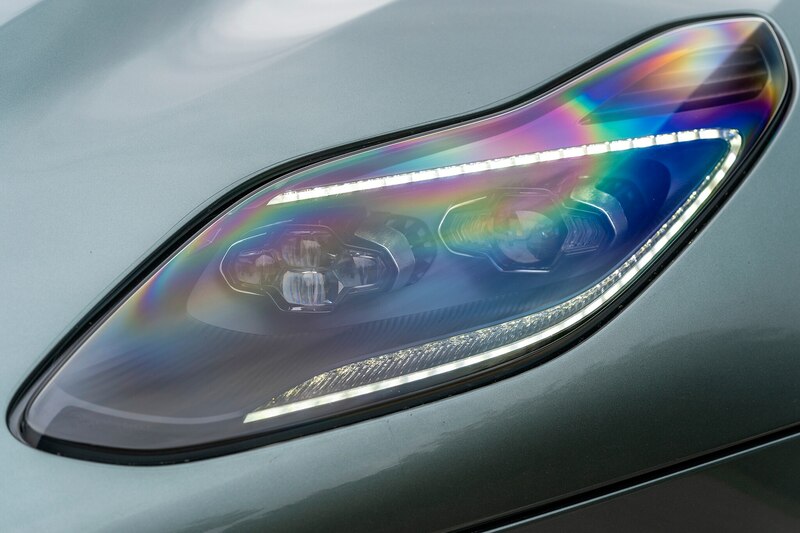 Completely useless in terms of performance, but completely necessary for putting a smile on your face. 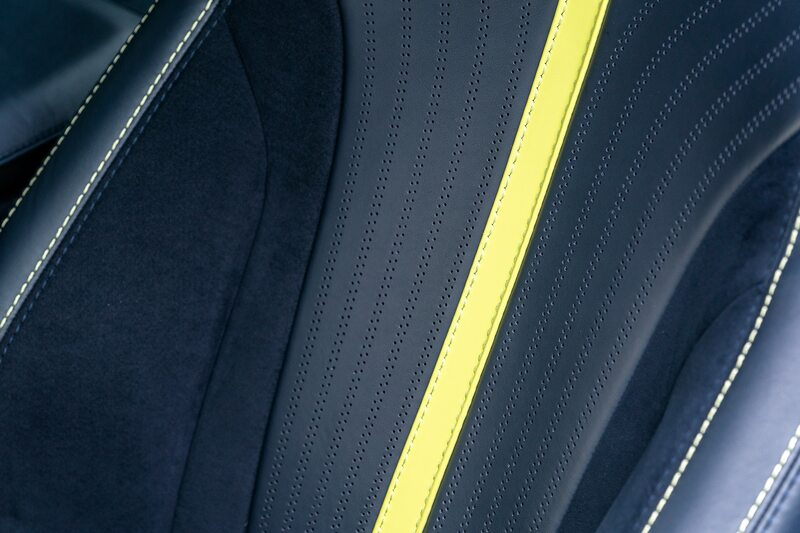 Now to those lime green details. 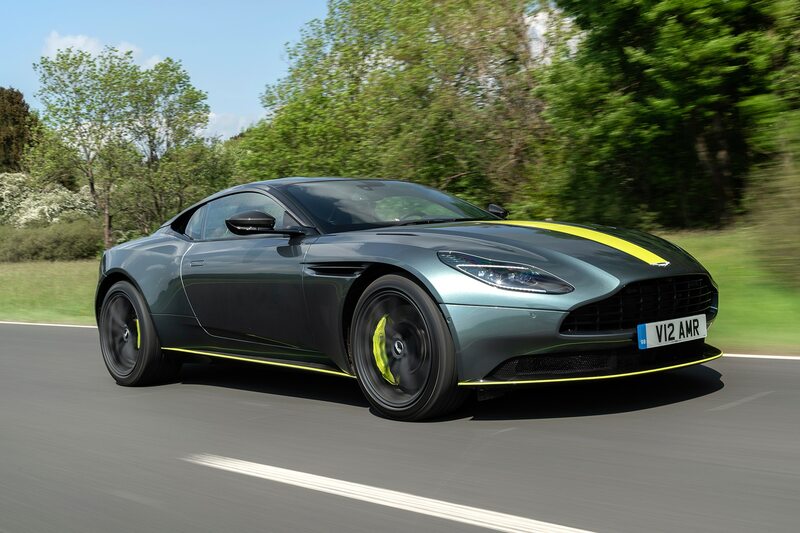 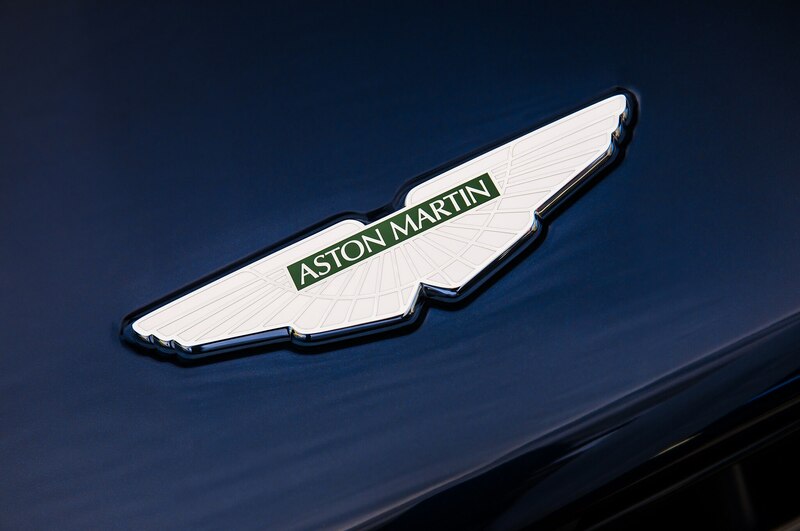 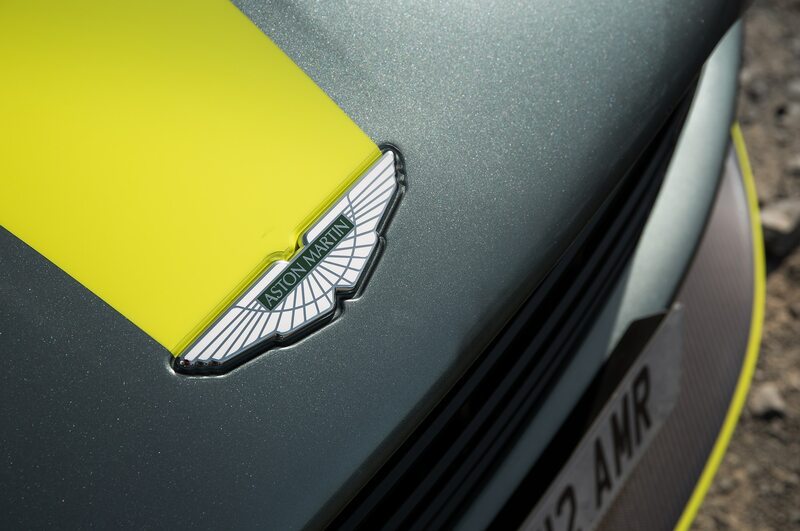 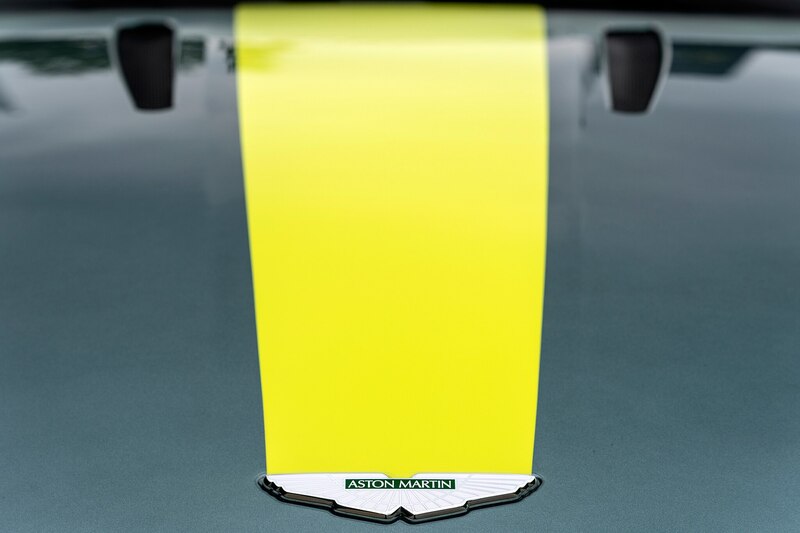 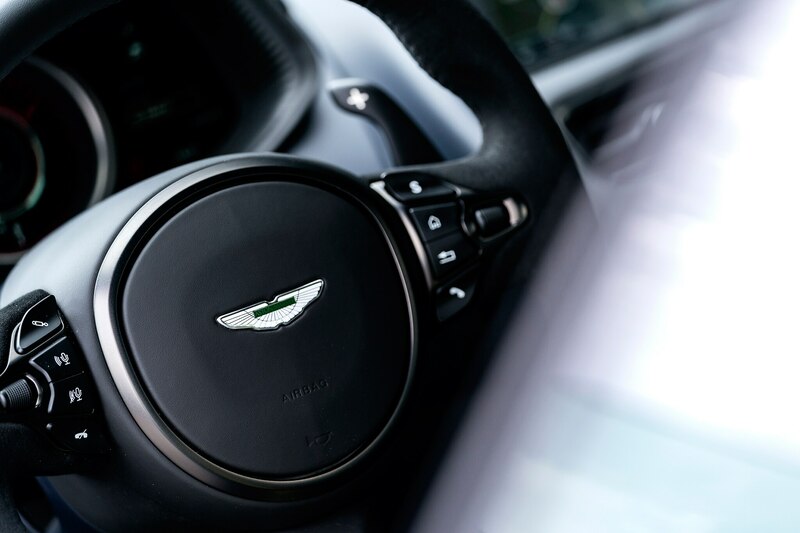 The signature edition is limited to 100 units and has bright green accents that span from the Aston logo on the hood to the base of the windscreen. 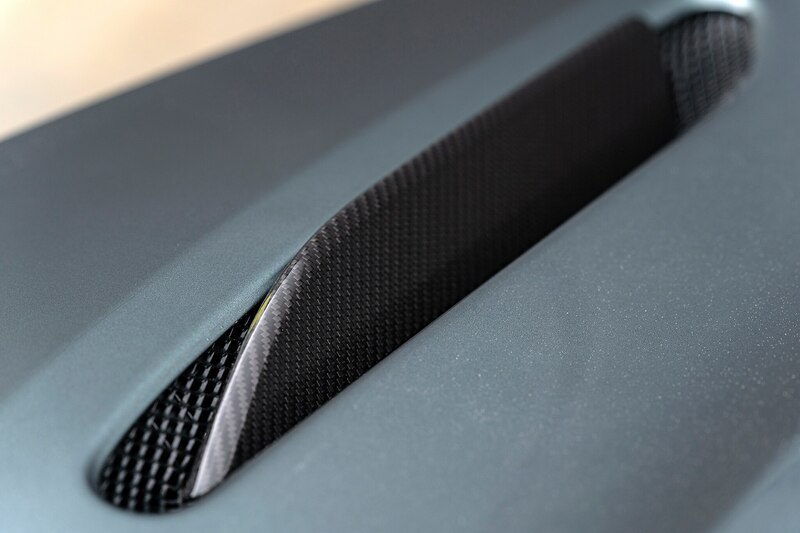 A stripe of the same color also runs along the outside lip of the front splitter, which in my humble eyes, kind of works. 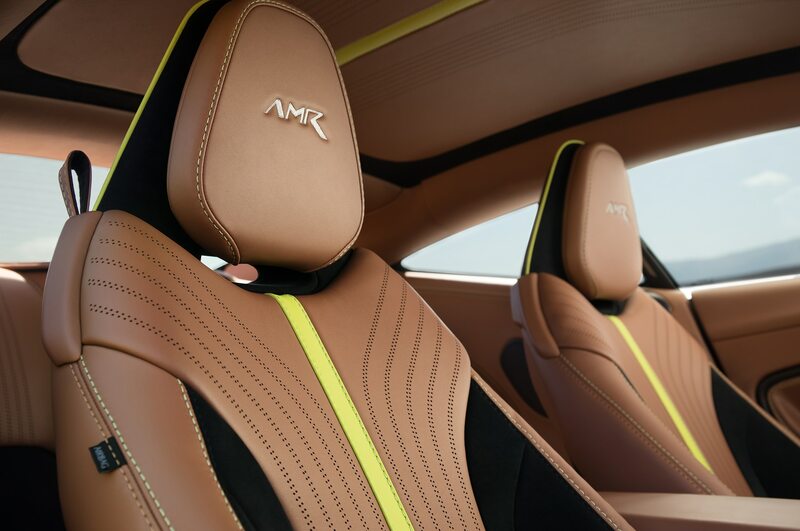 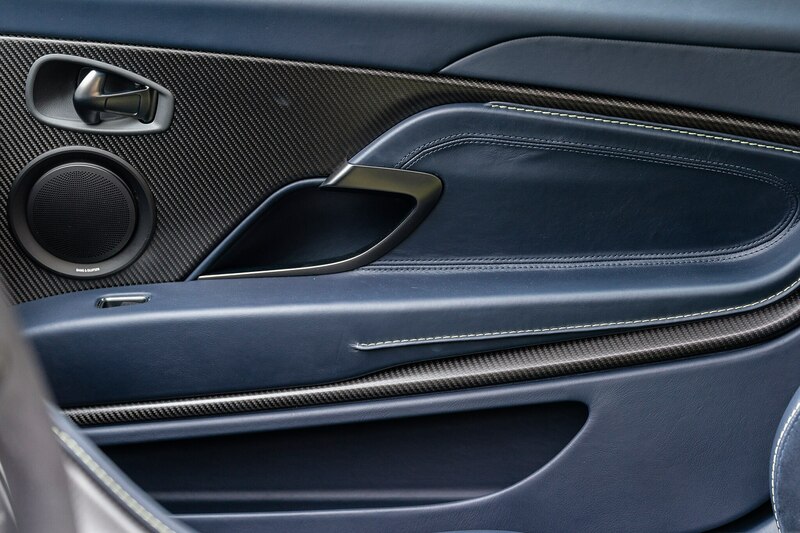 The six-piston brake calipers are also clad in the same hue, as is the interior stitching, and a stripe down the half leather, half Alcantara seats. 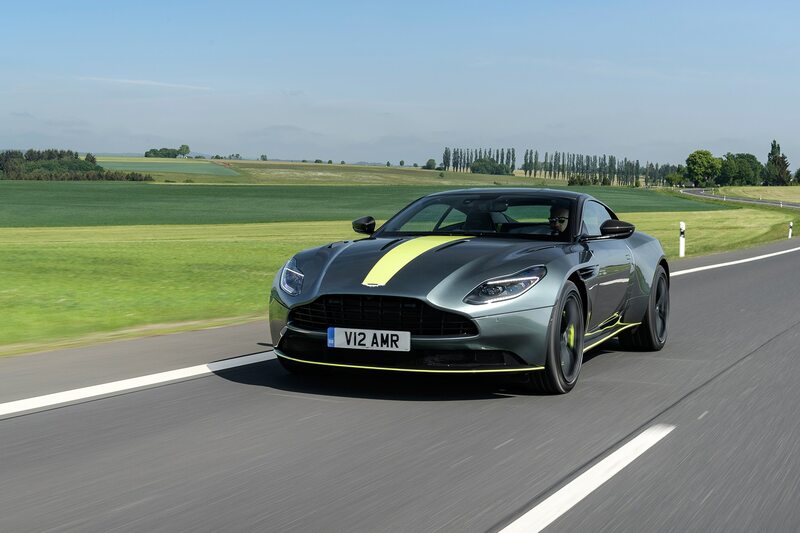 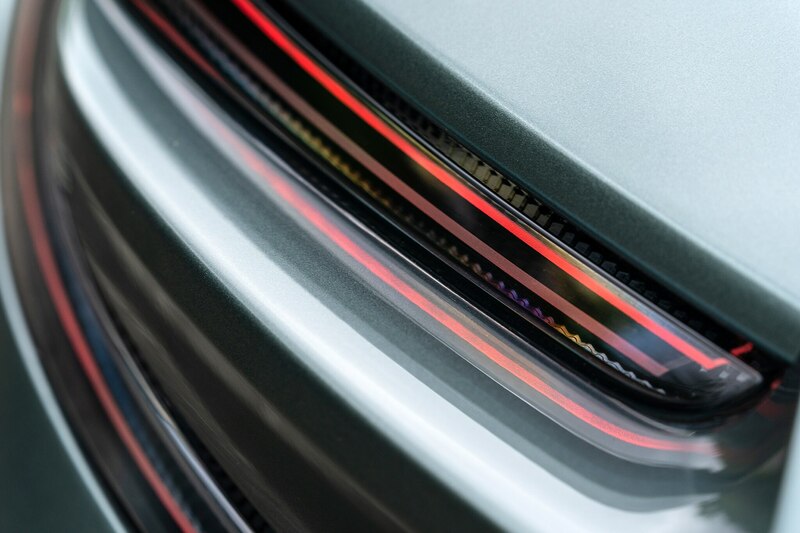 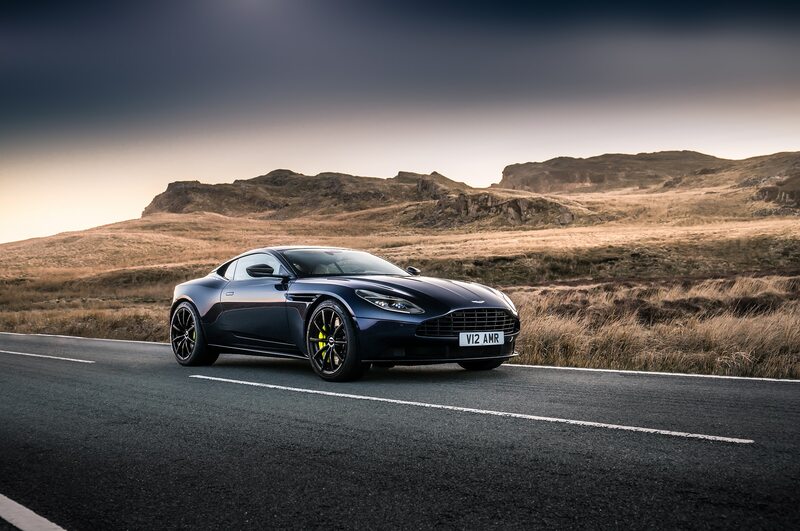 The DB11 AMR comes with other cosmetic upgrades such as darker headlight surrounds, smoked tail lights, dark front grille, dark tailpipes and gloss black roof (or carbon as an option). 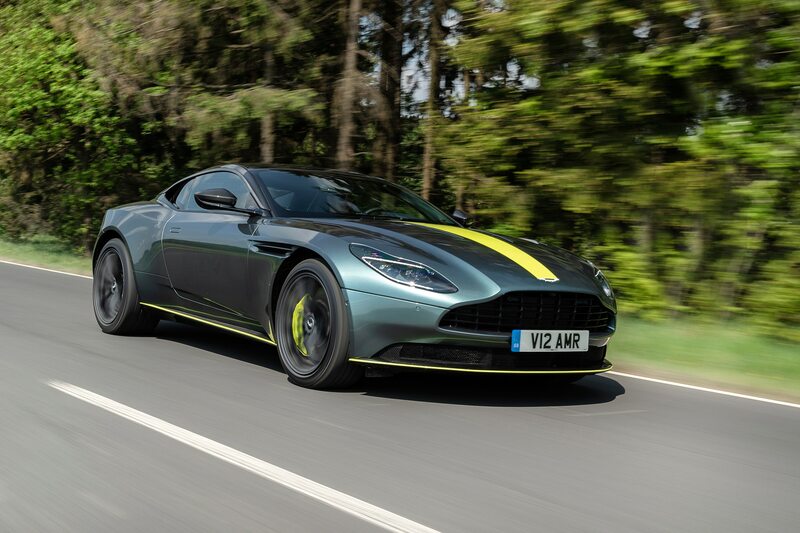 If you miss your chance at the first 100 signature editions, the DB11 AMR will still come with lime green calipers, but not the Sterling Green paint and green stripes. 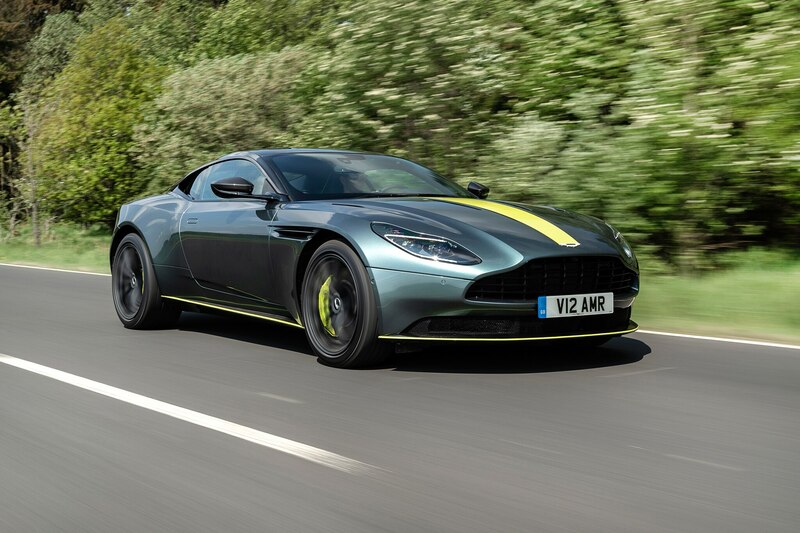 The only qualms I have with the DB11 AMR is the programming of the eight-speed ZF automatic. 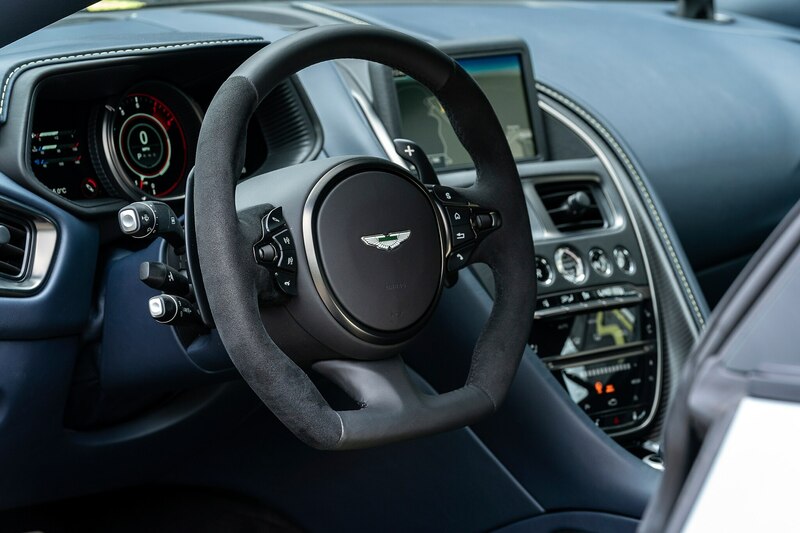 In GT mode it works remarkably well with its smooth and soft changing of gears. 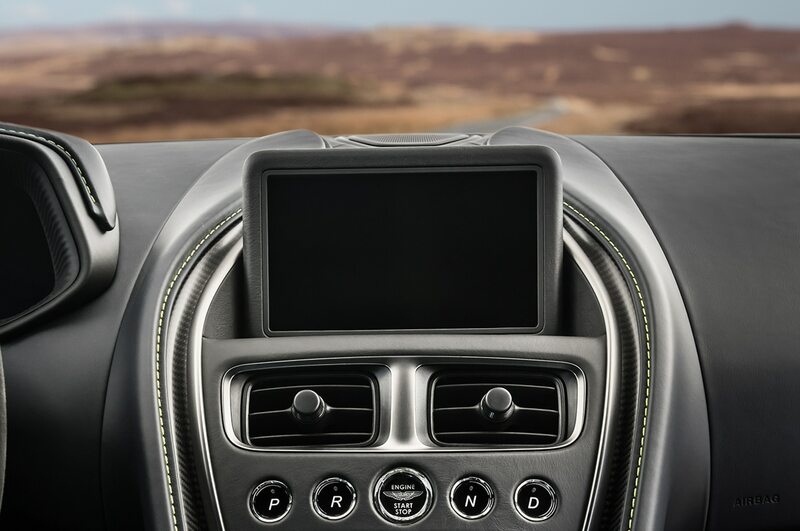 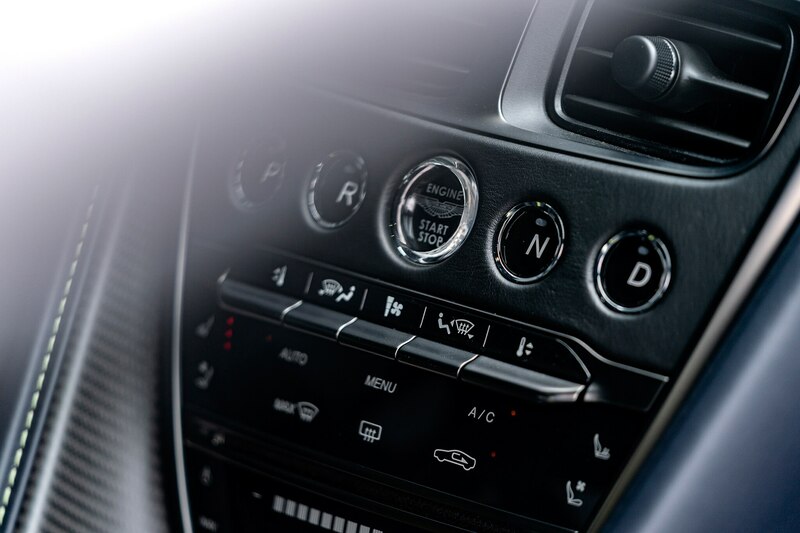 Flick the powertrain system into Sport mode however, and you get a different story. 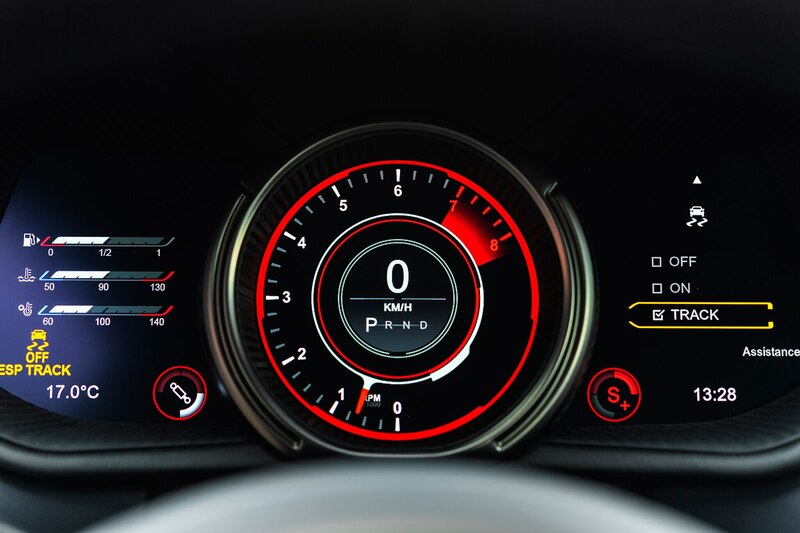 If you want to overtake someone, the kick-down strategy is monumentally slow and abrupt in nature—it uses the same logic as the manual up and down shifts where there is an engineered kick in the back, which feels great when working your way through the gears, but kicking down from seventh to second doesn’t work so well. 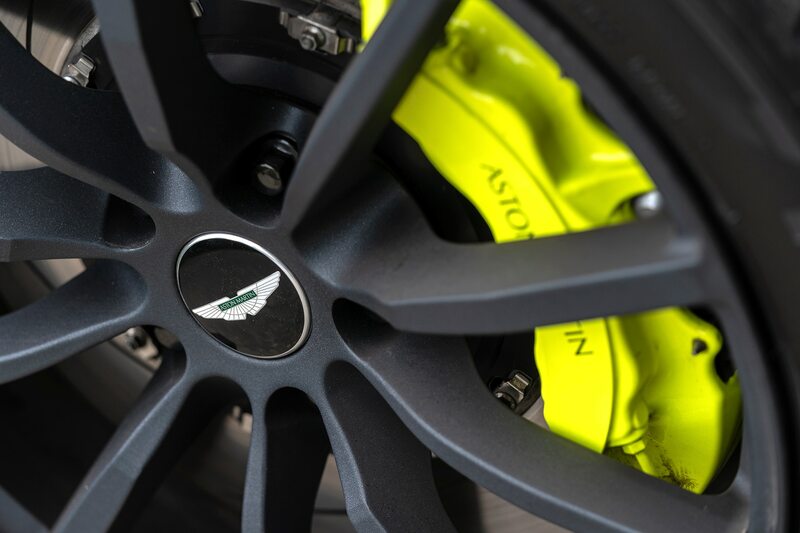 Splitting hairs, I know, but an easy fix for Aston’s engineers. An AMR DB11 can be yours from $241,000 with the first lucky few to receive before the end of the second quarter. 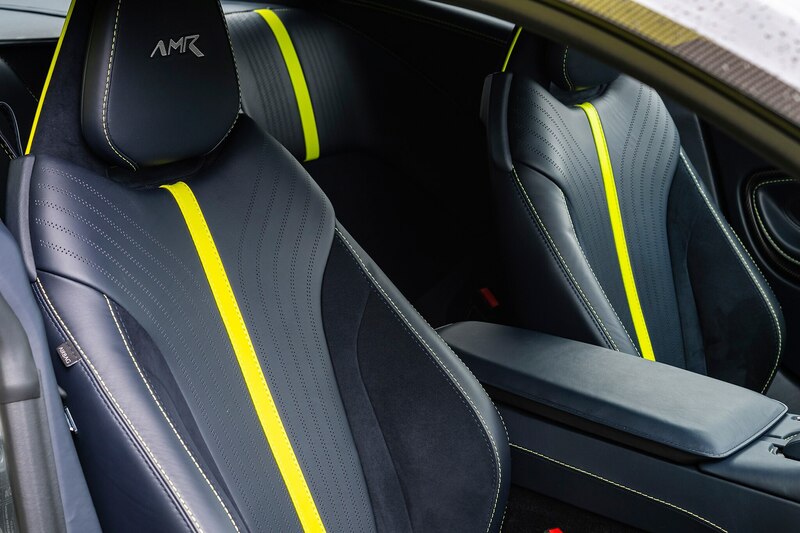 If you want the signature edition, dig a little deeper into your pockets and find an extra $37,000 for those green stripes and extra exclusivity. 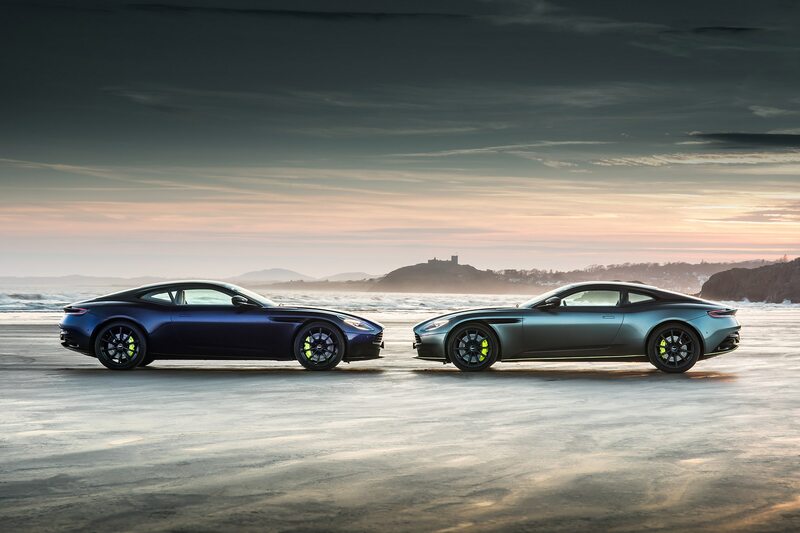 So the burning question remains, have Aston Martin struck a perfect balance between Grand Tourer and Sportscar? 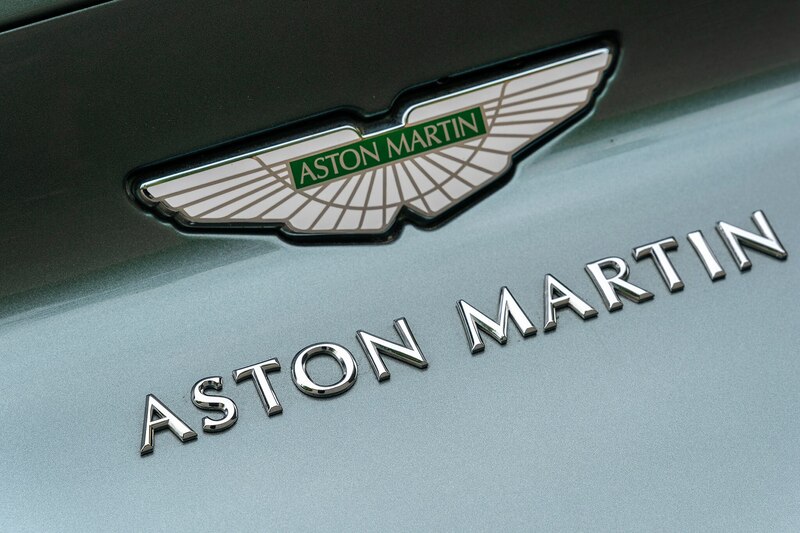 I’d say they have. 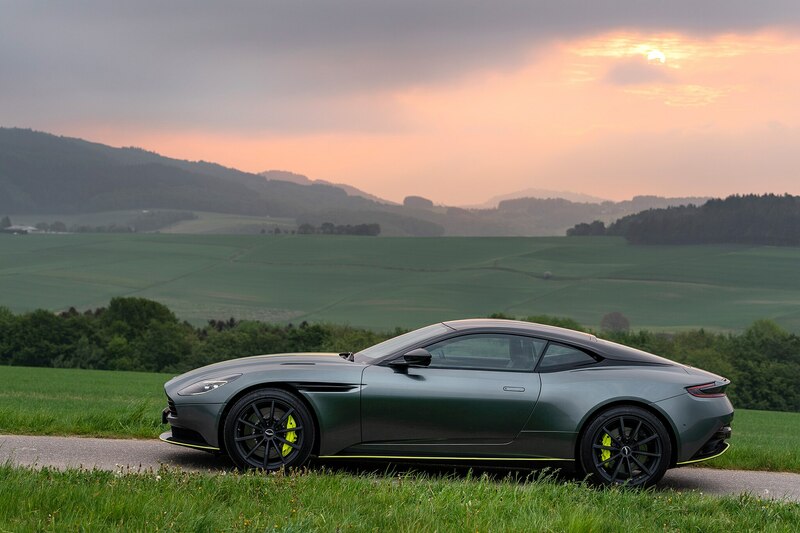 The 2019 Aston Martin DB11 AMR is smooth and feels at home chewing through mileage on the autobahn, but with the flick of a switch, can demolish back roads with some tail out action if you see fit.